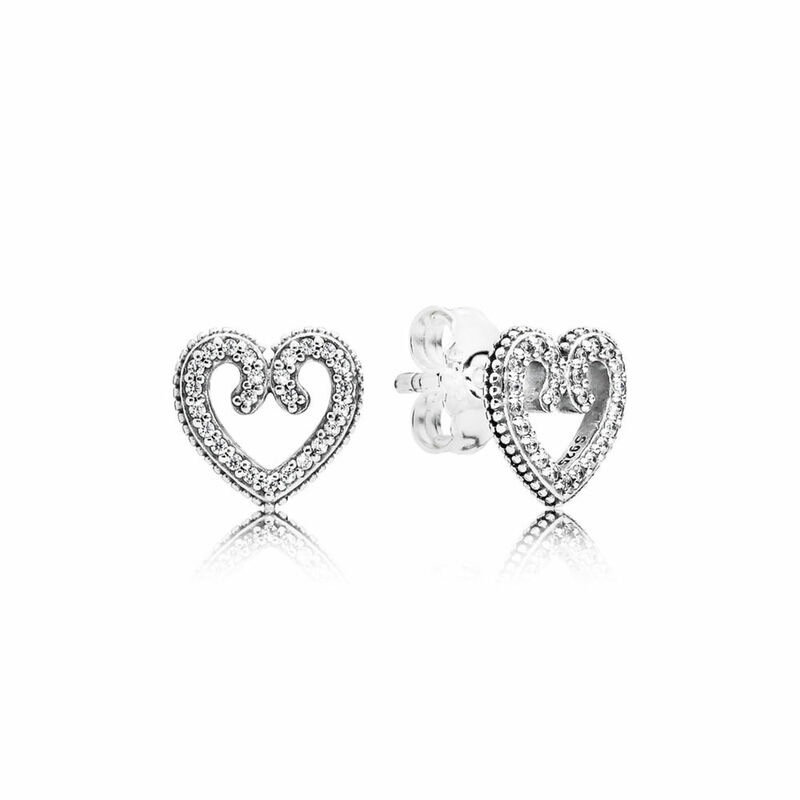 The PANDORA collection we have been waiting for is finally here! 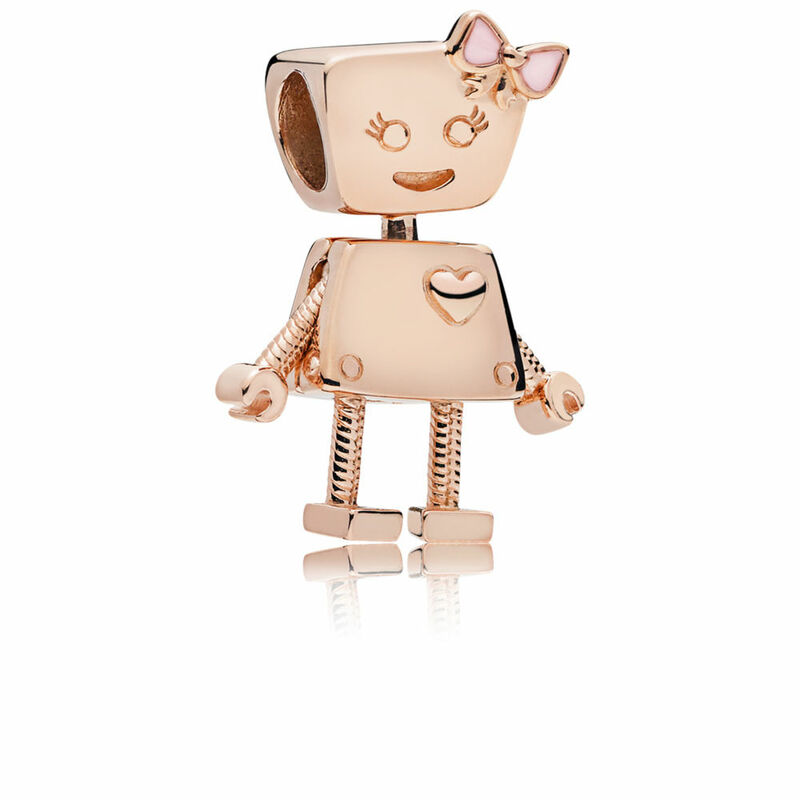 The Bella Bot Charm is one of the charms I am most excited about! 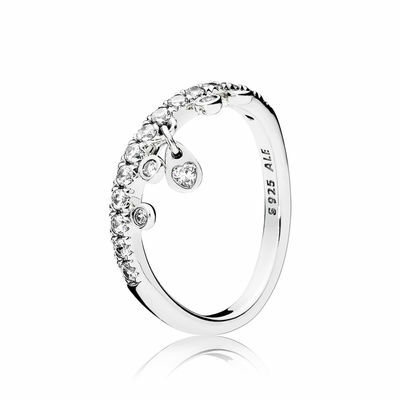 I am delighted to see designs like this coming from PANDORA! Apparently her limbs are moveable too! She is presented in an exclusive Bella Bot gift box. 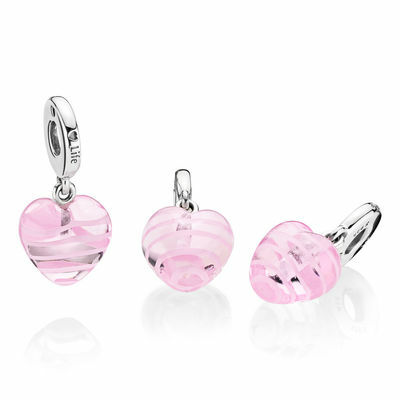 Despite not being an official Breast Cancer Awareness Charm the Pink Ribbon Heart Dangle with its pretty pink swirling ribbon design is fit to represent awareness for Breast Cancer. The heart stamp and ‘life’ message on the bale are a cute touch too. The blue version of the Ribbon Heart Dangle has the ripple effect of water which would lends a feeling of calm to your bracelet. Embellished with a multitude of crystals in radiant purple, green and blue hues. 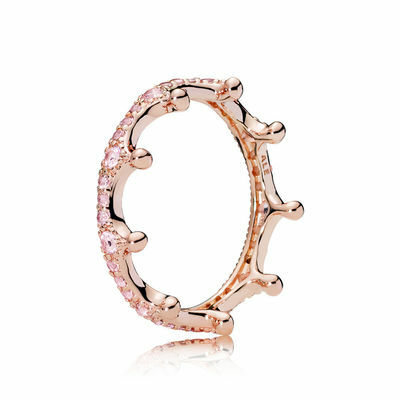 Embellished with clear stones and adorned with a hanging heart-shaped stone, this spacer is quite luxurious! 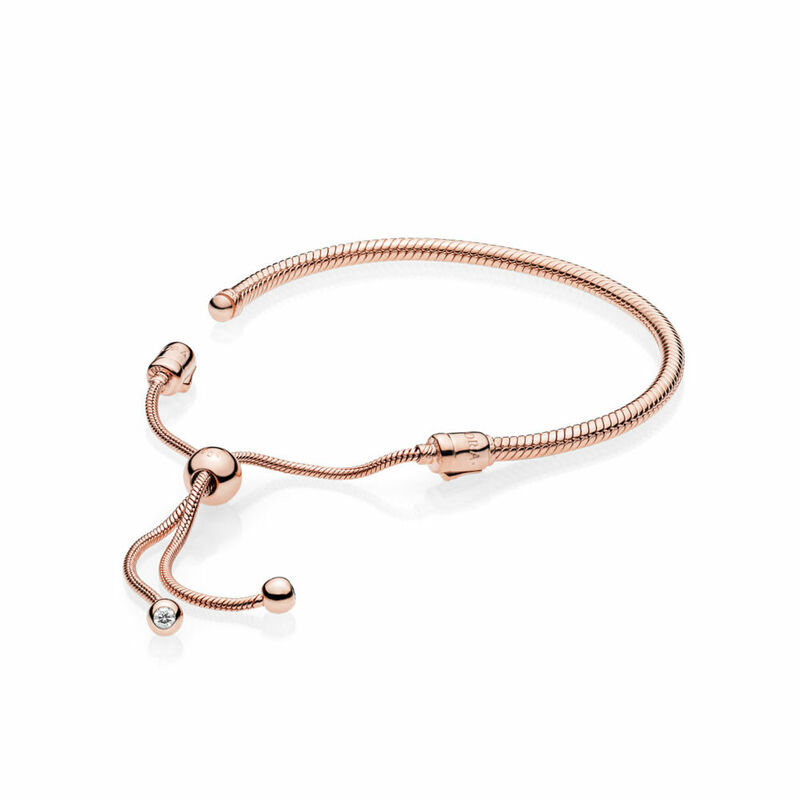 I am interested to see how it looks on a bracelet as it is very delicate looking. The Blue Ripples charm in aqua blue crystal has a delightful texture, creating the appearance of rippling water glistening in the sunlight. 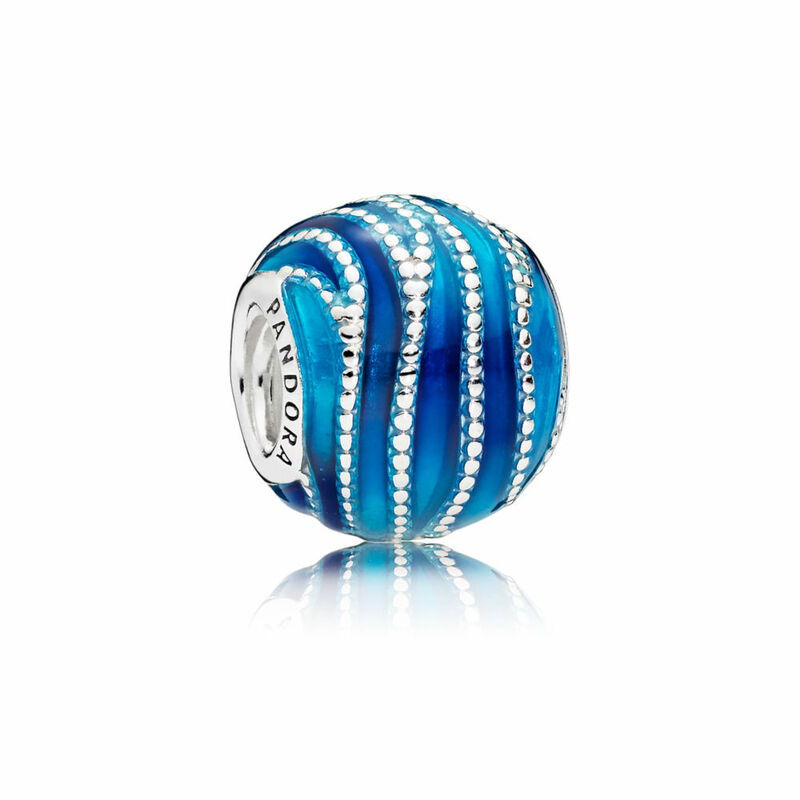 The Blue Swirls charm also has a lovely waving design in a mix of blue enamels with silver beading between. 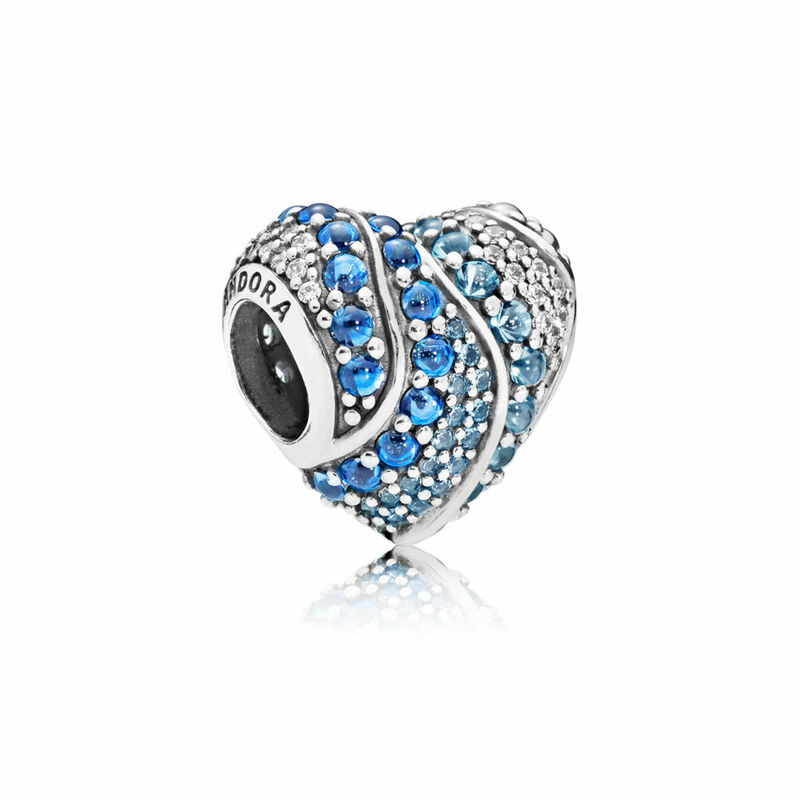 The beautiful blues continues with the Aqua Heart charm in multi coloured cubic zirconia and crystals. Never mind Spring, the stunning blue crystals are getting me in the mood for summer already! 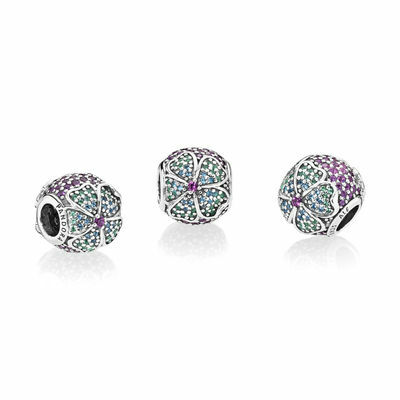 The Enchanted Pavé Charm is full of multi colour cubic zirconia and crystals. 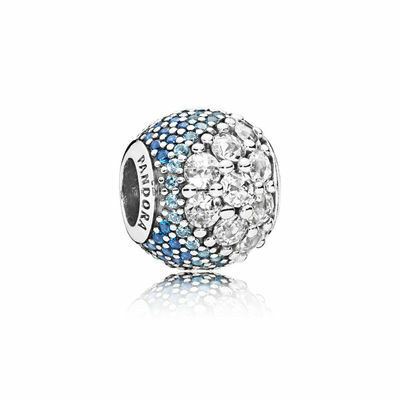 Whilst I like the deep blue and aqua colours of this charm it is a bit too blingy for my taste. 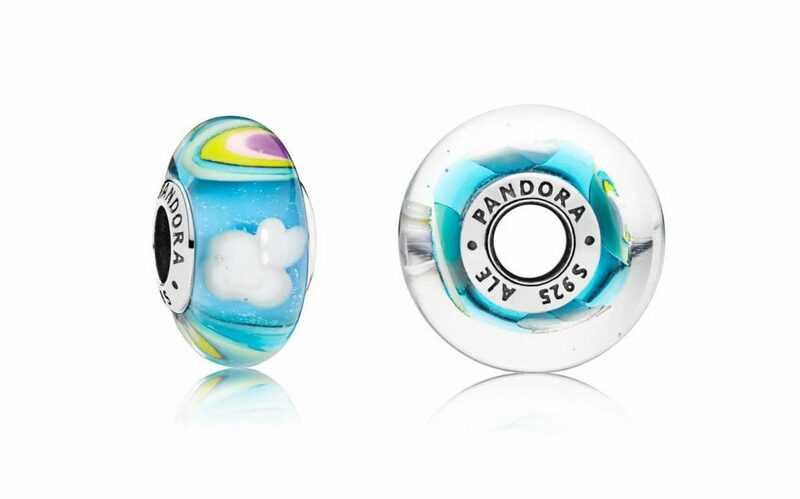 The Iridescent Rainbow Glass is already a must-have for many PANDORA fans. I love the sparkly blue and little tufty heart shaped cloud! 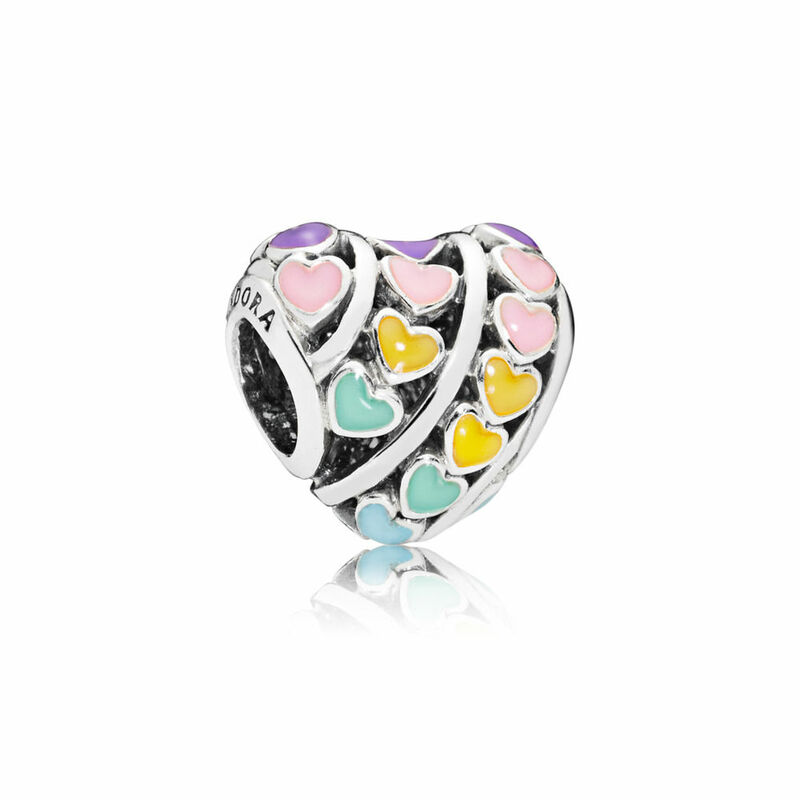 The Rainbow of Love Dangle Charm is beaming with a mixture of hand painted enamels and a sweet dangling heart. 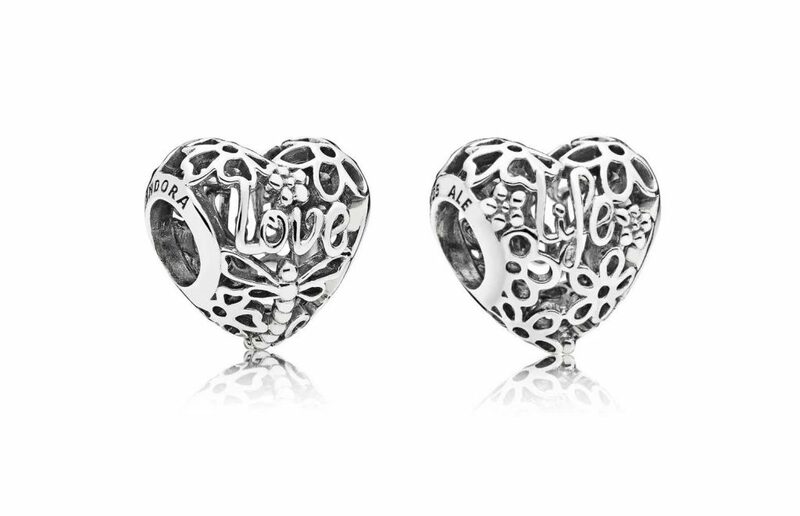 The bale features the word “life” engraved on the base of the charm, next to a petite heart. The Enchanted Heart Clip is a refreshing new design and its heart shape and heraldic lace details are fit for a modern fairy tale. 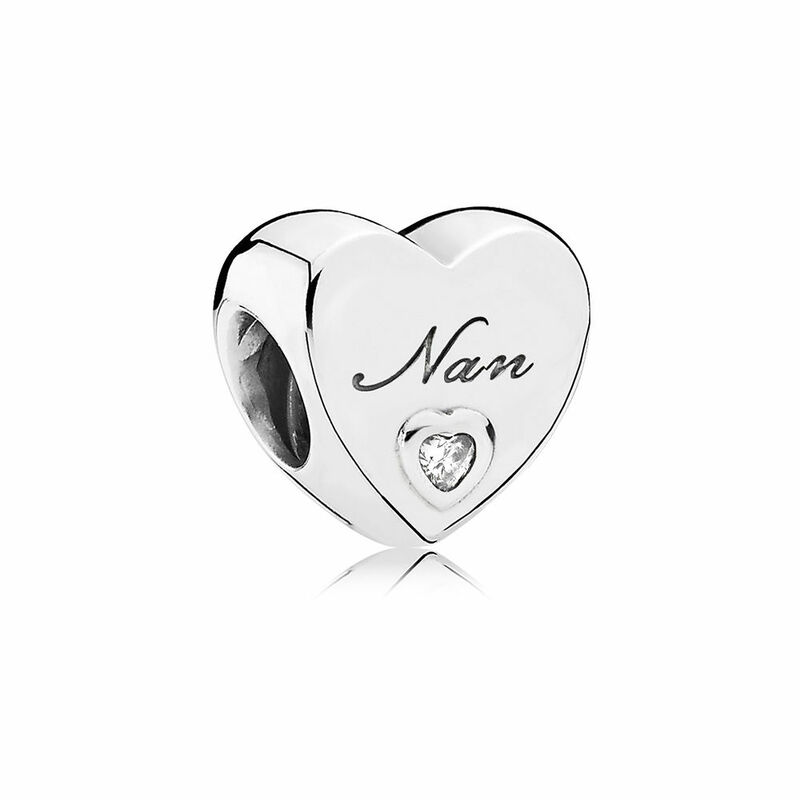 Engraved with “Nan” on both sides, this charm is also embellished with two clear stones to add the perfect hint of sparkle. The Enchanted Heart Safety Chain is pretty and simple. 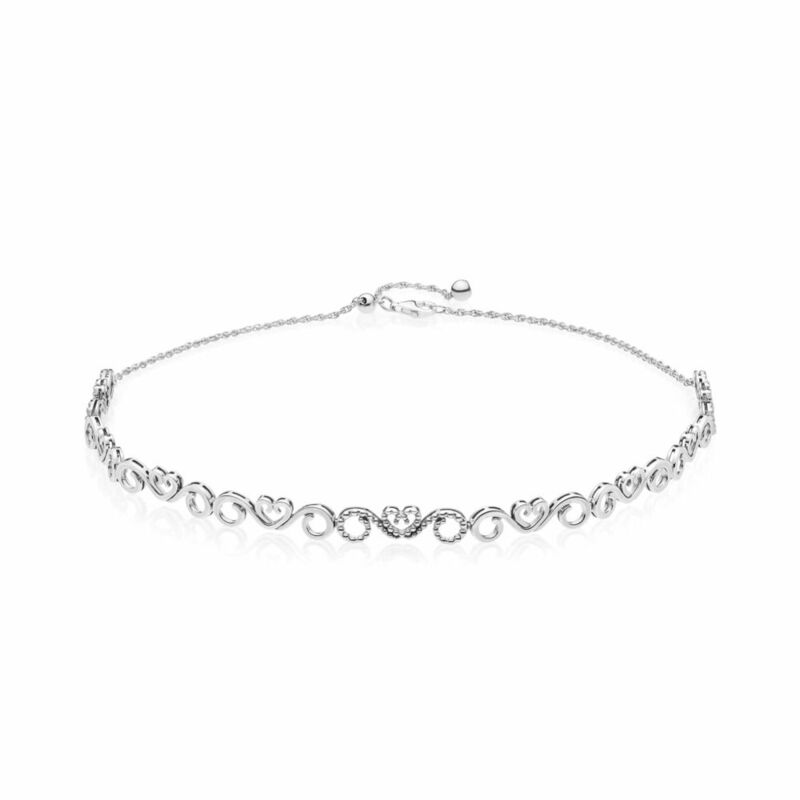 It is a nice to have a plain silver safety chain option at last as not everyone likes cubic zirconia. 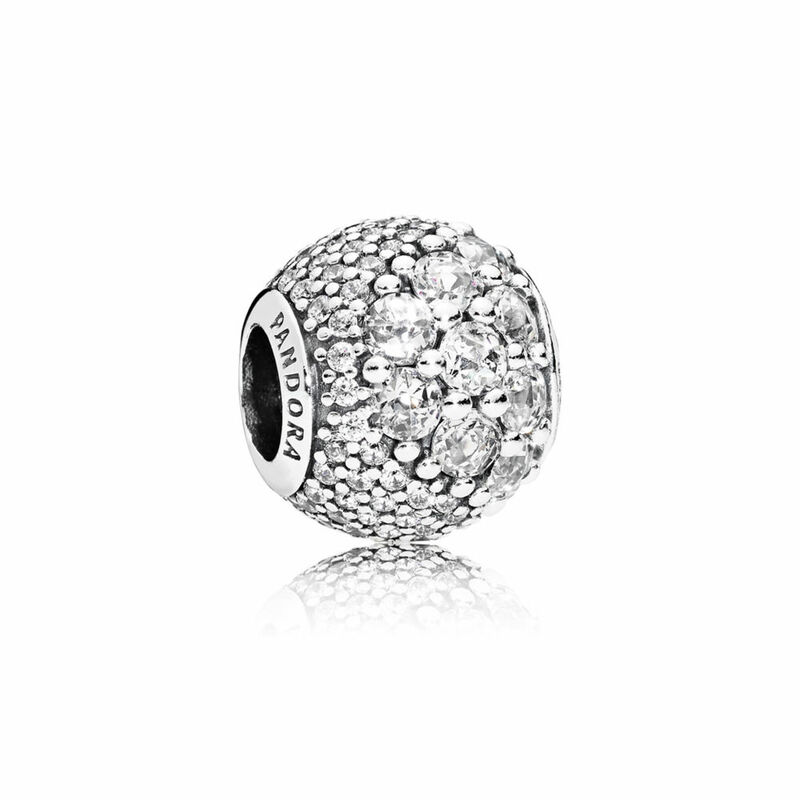 The sparkling clear stones in different sizes create an enchanting glitter ball effect in this dazzling charm. 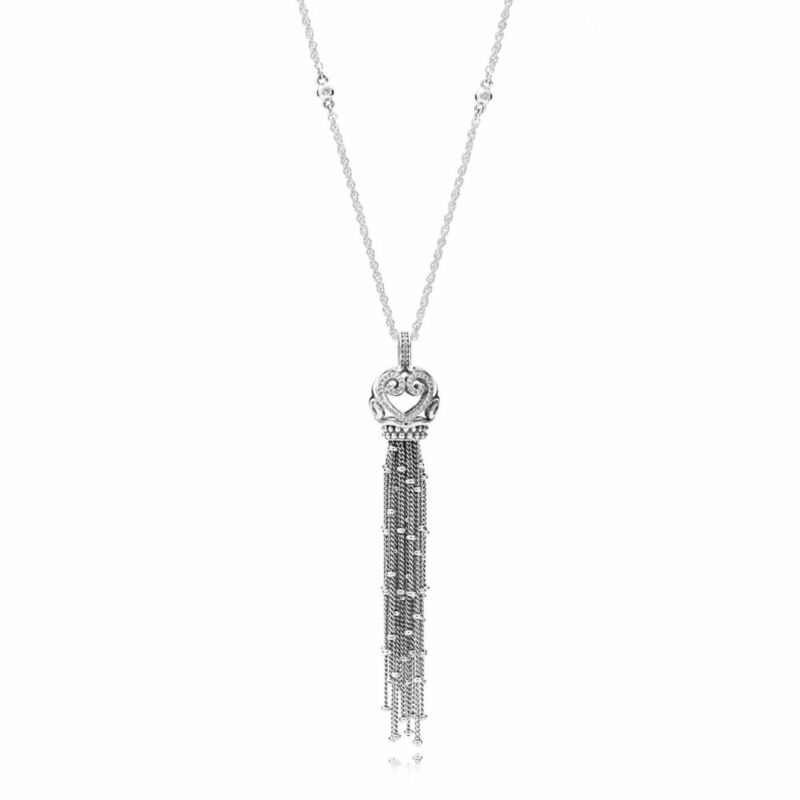 The Enchanted Tassel with clear cubic zirconia would look fabulous on a necklace! 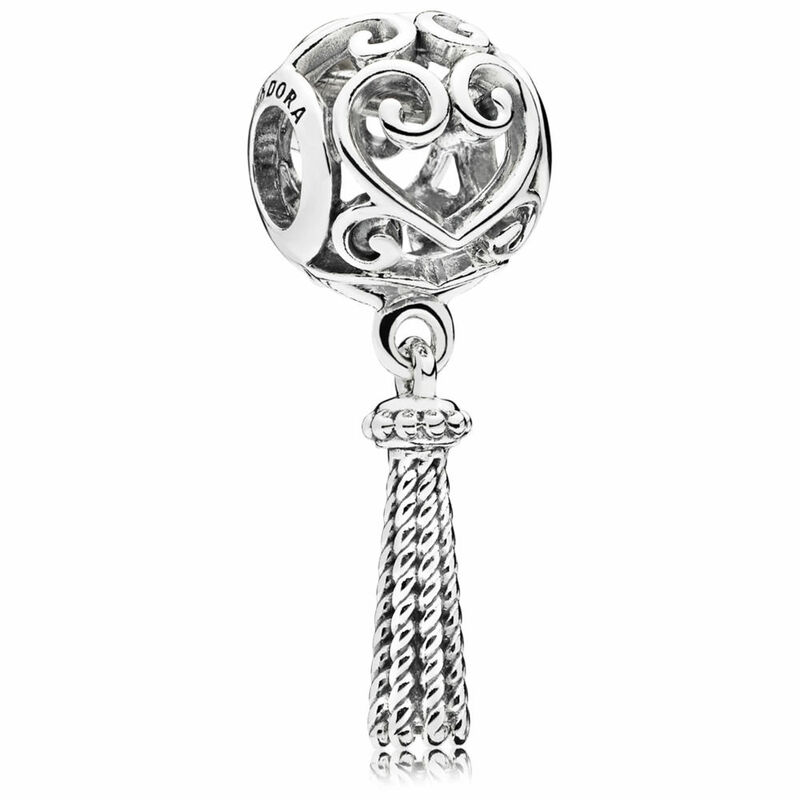 The Enchanted Heart Tassel Charm is one of my favourites from the Spring 2018 collection! 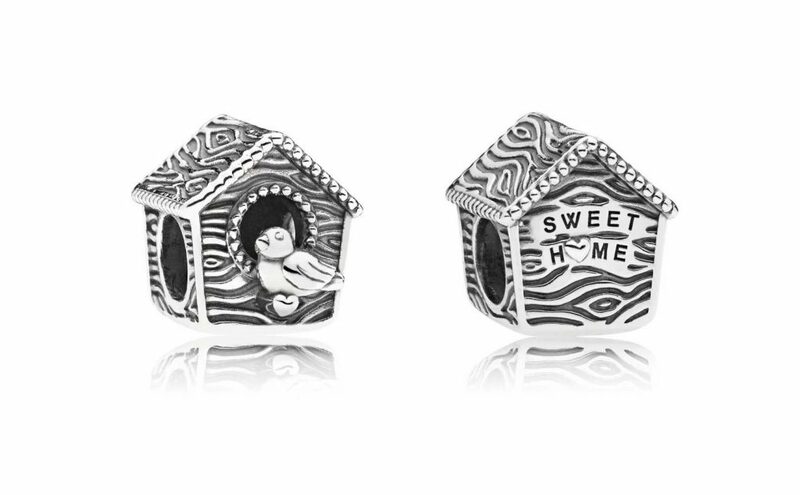 The Spring Bird House is super cute and reminds me of the PANDORA Dog House charm! 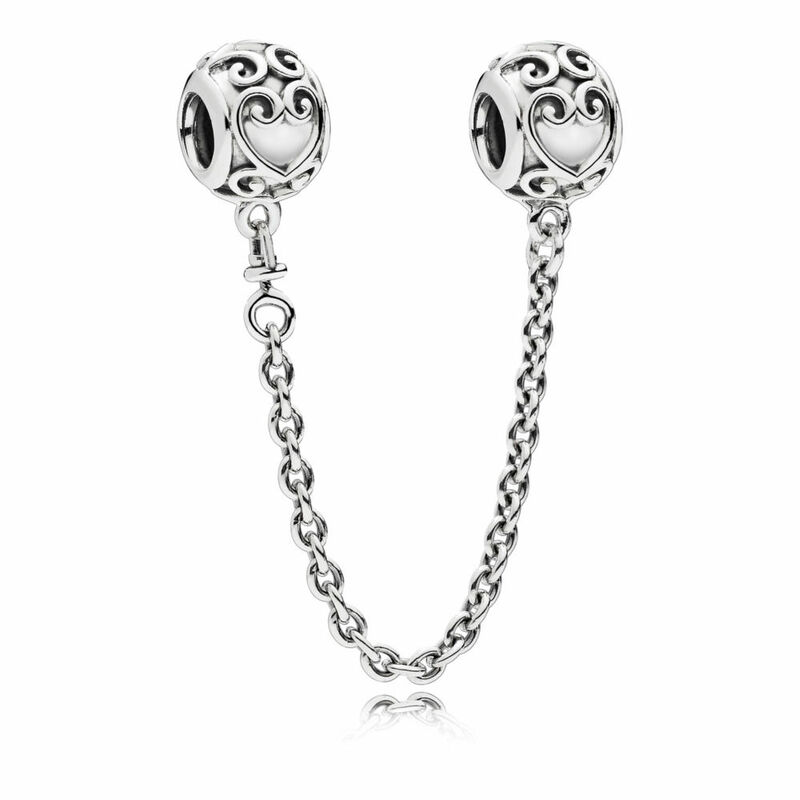 I love the oxidisation on this charm and it will definitely be on my wish list. The little branch the bird sits on is a small heart which is fun! The Enchanted Garden Glass is incredibly detailed and features a little bee collecting pollen from the flowers. This is another must-have for me! 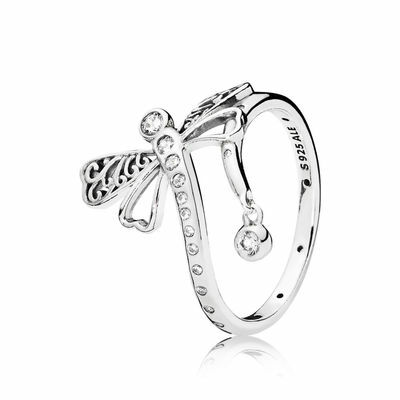 The Dreamy Dragonfly Charm is like a pretty combination of the Dragonfly Meadow with the Galaxy charm. 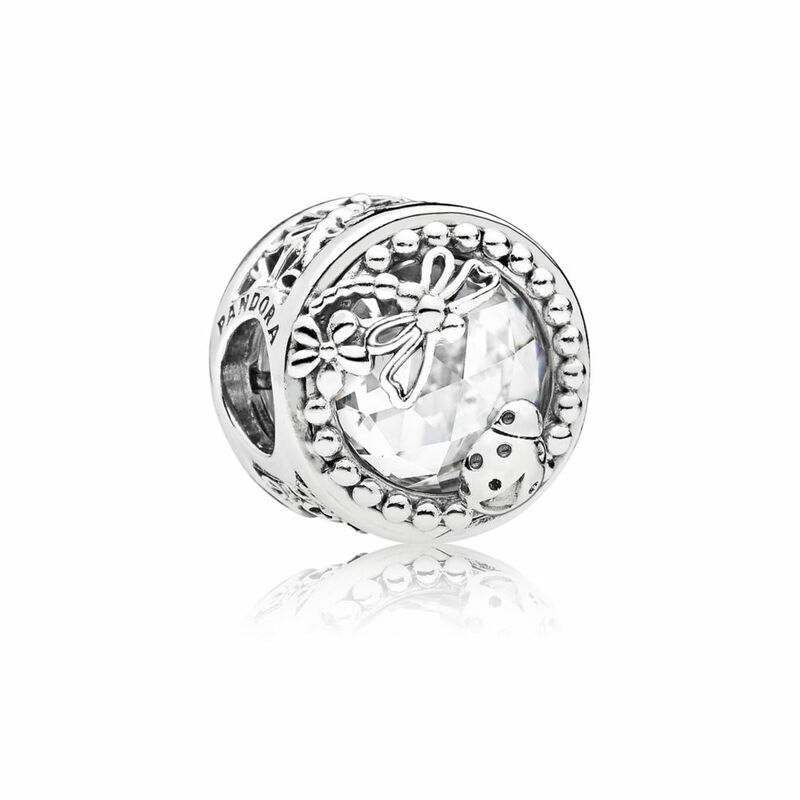 The Enchanted Nature Charm is a button style charm which depicts a cute ladybird / ladybug and dragonfly over a large clear cubic zirconia stone. 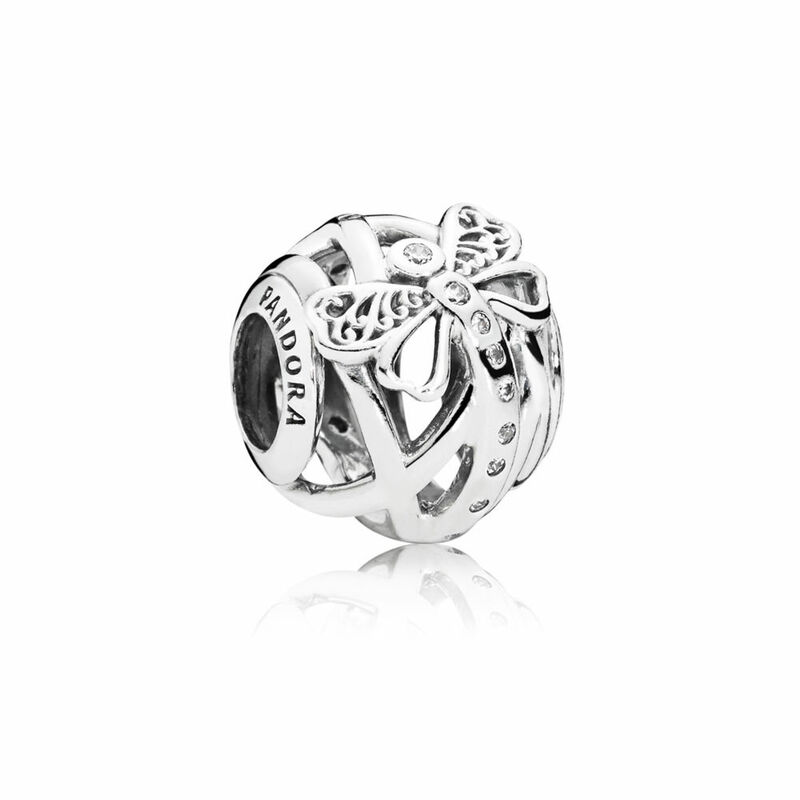 The Promise of Spring charm is a pretty openwork design with a dragonfly, flowers and the words ‘Love’ and ‘Life’ either side. 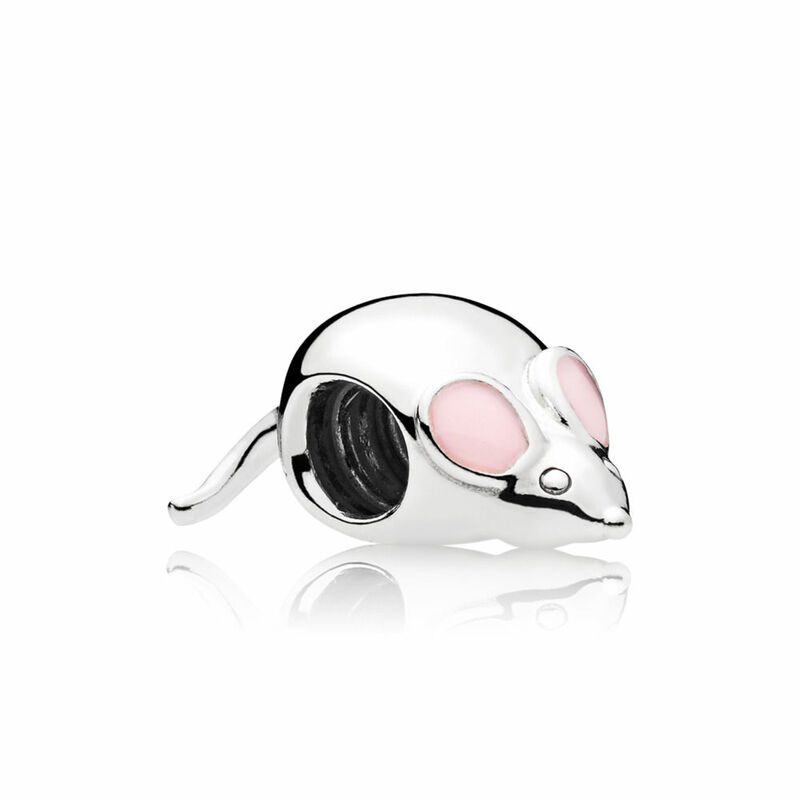 This little mouse charm has a moveable tail, which will bring a playful element to your bracelet. 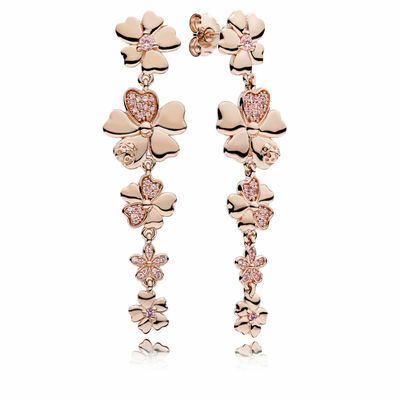 It also features pale pink enamel ears. I am a bit concerned at how much the tale pokes out and whether it would snag on clothes. 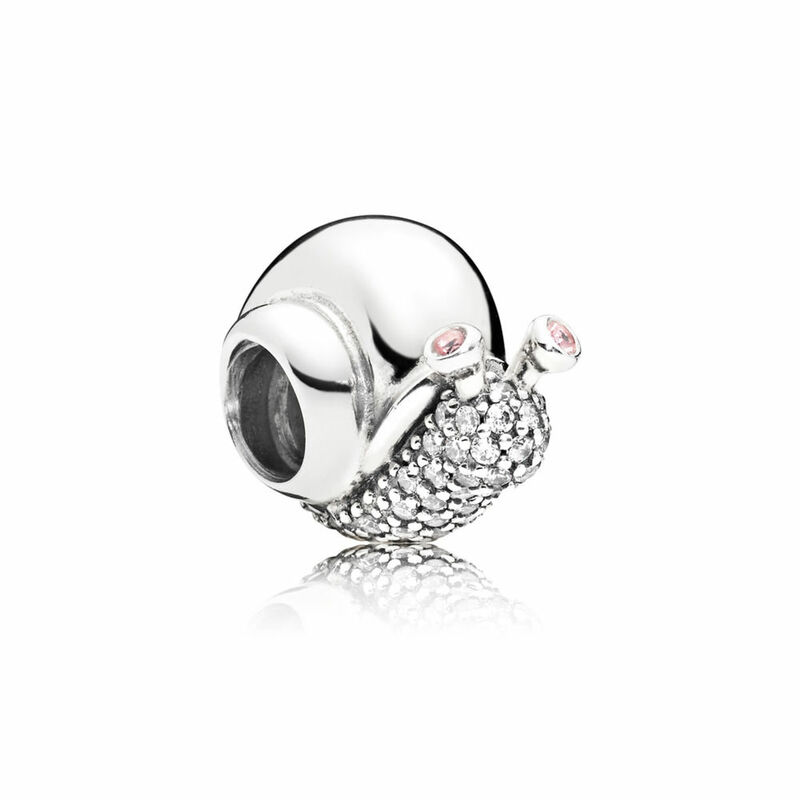 The Sparkling Snail shows that you’ll always get to where you need to go in style, and at your own pace! 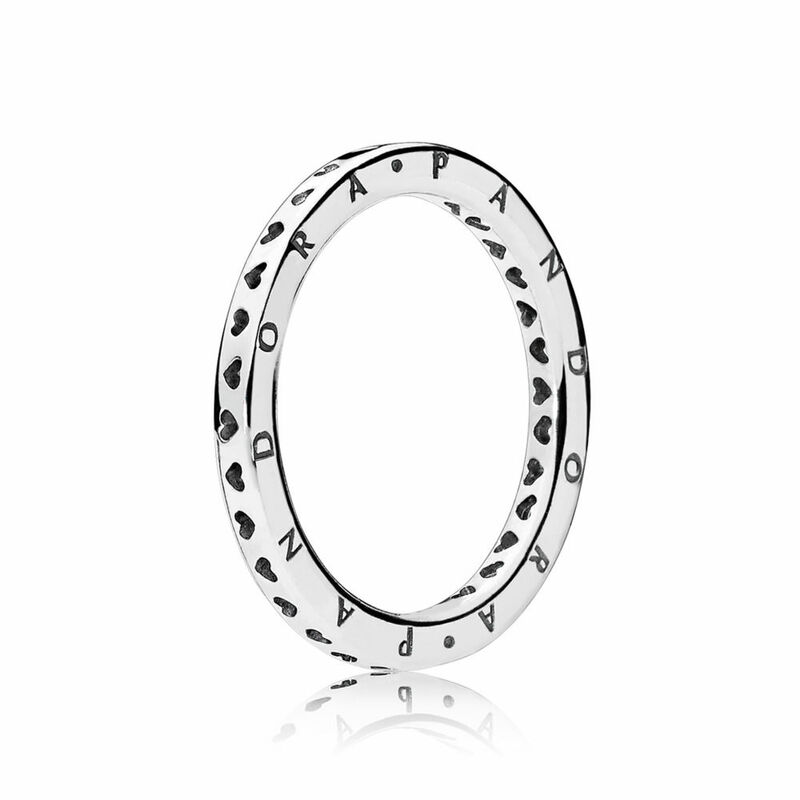 It is nice to see PANDORA releasing new designs like this and I hope it continues! The Wildflower Meadow Spacer is quite a slim design and it appears that the spacers in the Spring 2018 collection are getting thinner and are more in keeping with the older PANDORA Spacers. The Wildflower Meadow Safety Chain is quite sweet but I am not very keen on the dangling purple crystal at the bottom of the chain. The hand painted enamel in cheerful pastels in perfect for Spring or a vacation themed bracelet. It makes me think of ice cream! 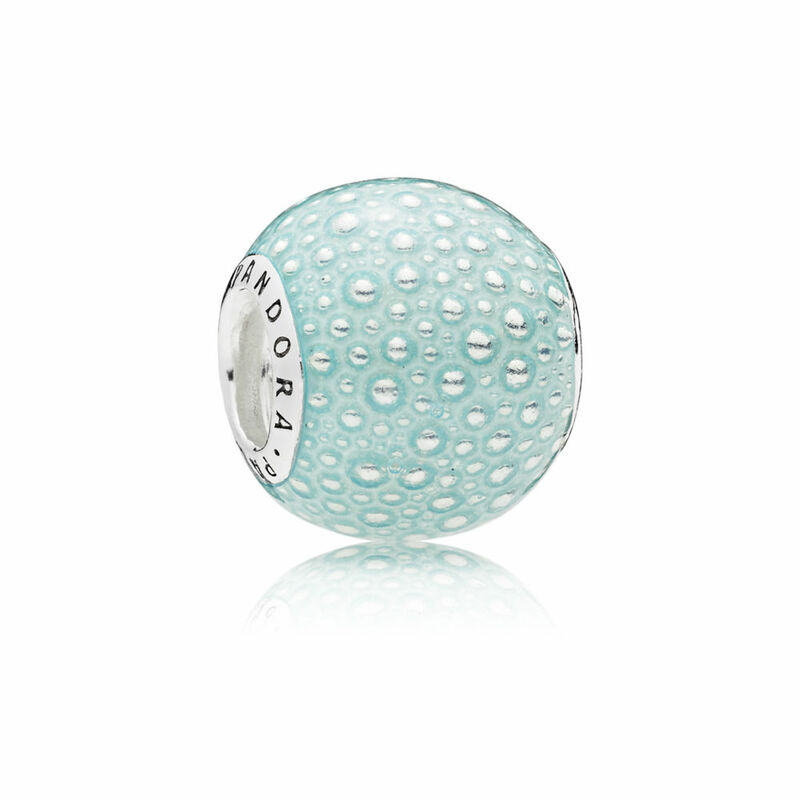 I adore the texture of the Aqua Enchantment Charm. 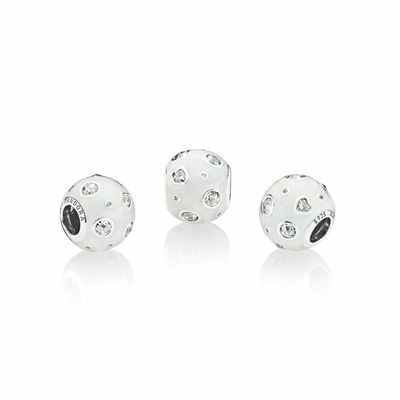 It appears to be a similar size to the Glitter Ball charms from the PANDORA Autumn 2017 Collection. The Sparkling Arcs of Love Clip has a silicone grip inside. 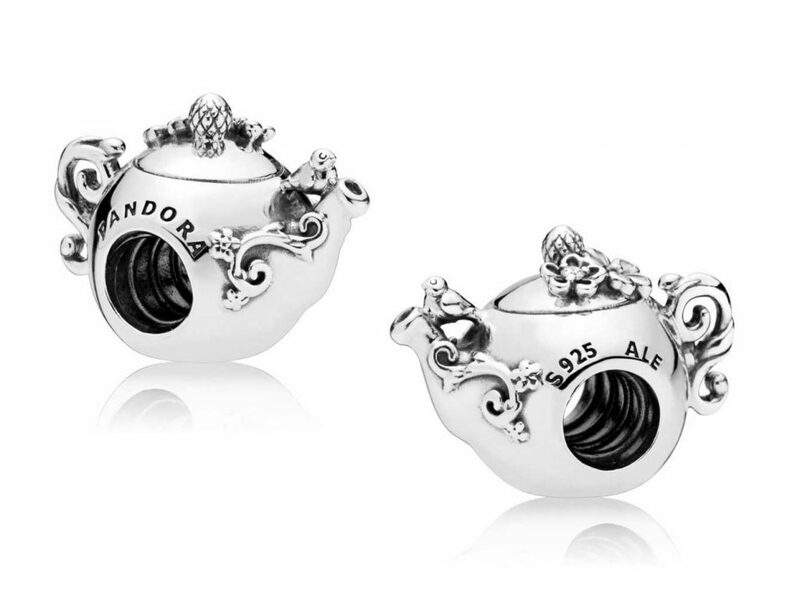 The Enchanted Tea Cup Dangle Charm is such fun! I love the tiny spoon on the side of the saucer. The Enchanted Tea Pot is a definite must-have for me! I already have the original two tone Teapot, and Mrs Potts & Chip charms and this would be a charming addition! The cheeky little bird on the spout and the acorn knob on the lid are fantastic details and this charm really does live up to it’s name! It is enchanting! 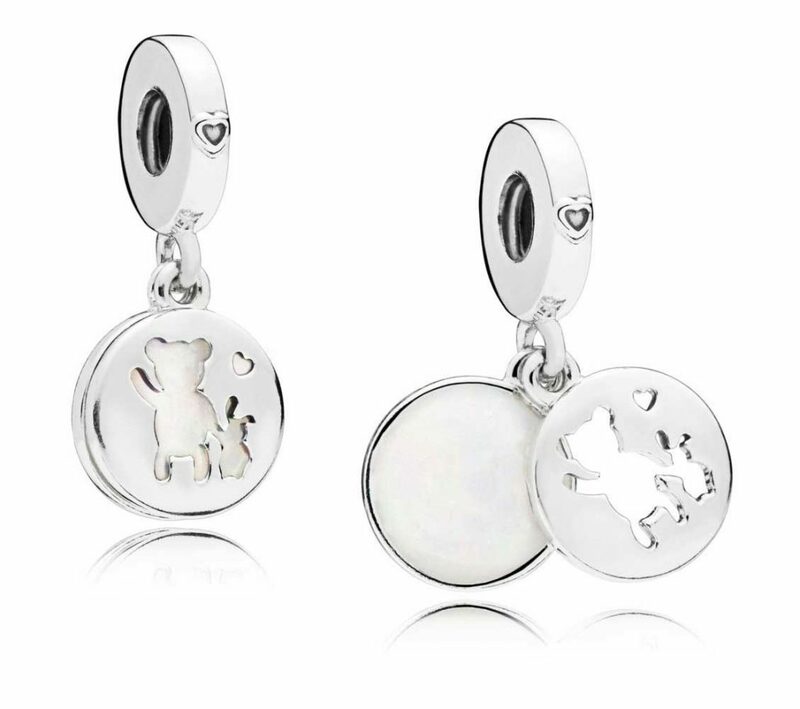 The Perfect Pals Dangle Charm has one disc of the pendant is filled with silver enamel and the other has a cut out silhouette of two friends holding hands. The design reminds me of Winnie the Pooh and Piglet and I think will be making it onto my wishlist! The colour seems to be the same peachy pink that was used on the Lace & Bow Heart charm last year. 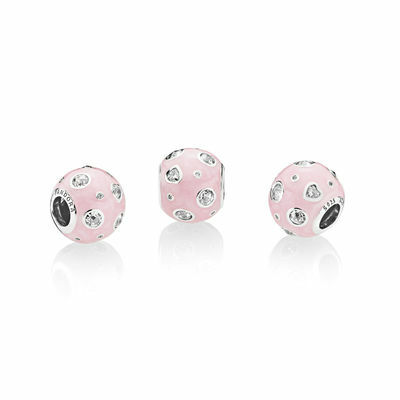 A combination of sparkling round and heart-shaped stones and pretty pearlescent pink enamel. 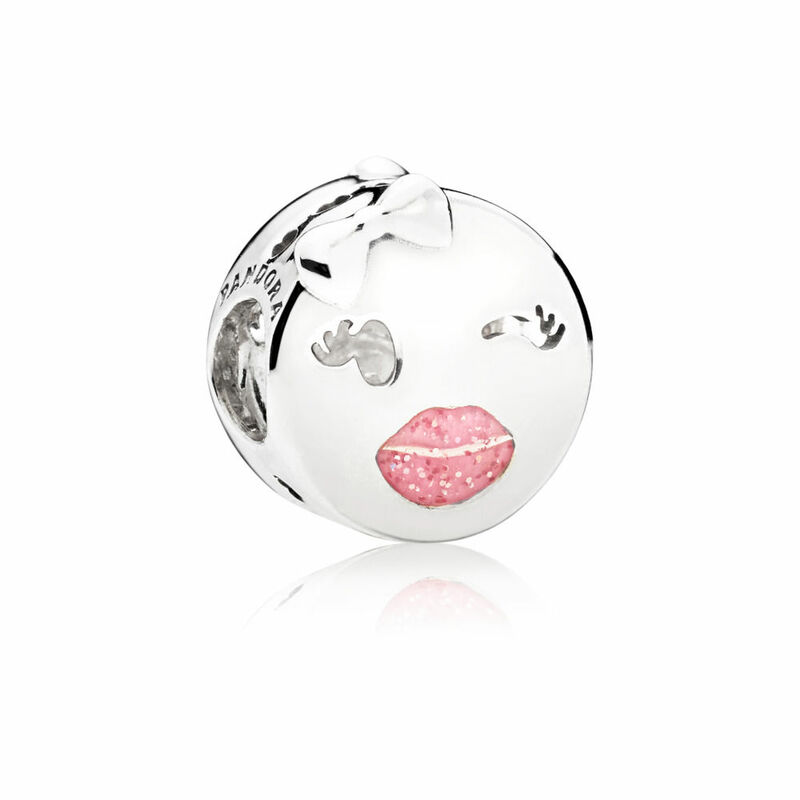 The silver enamel version is quite sweet and would look cute with the upcoming Balloon Charms! 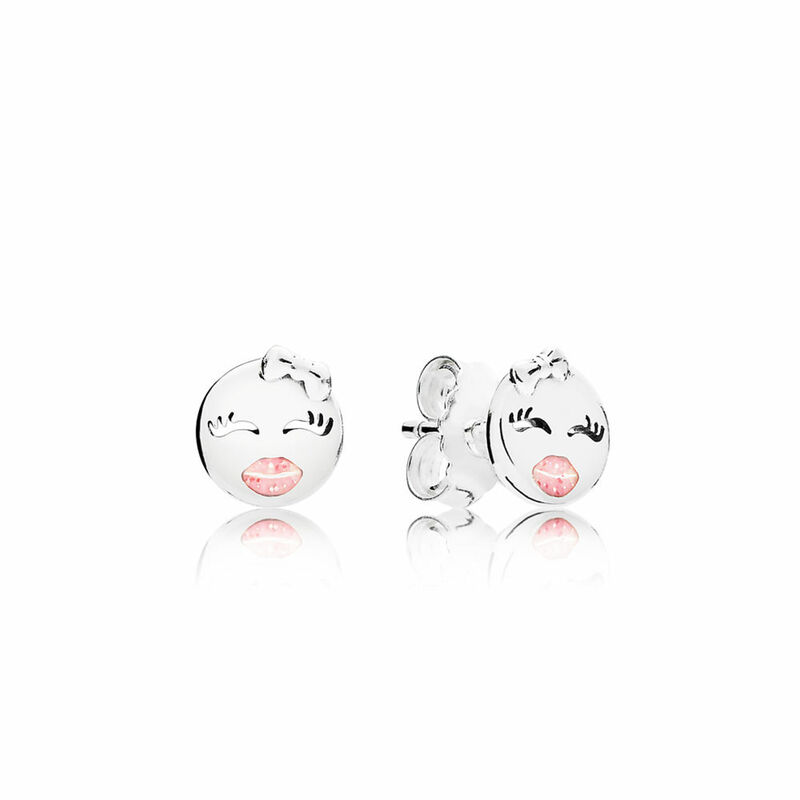 The emoji charms have returned! 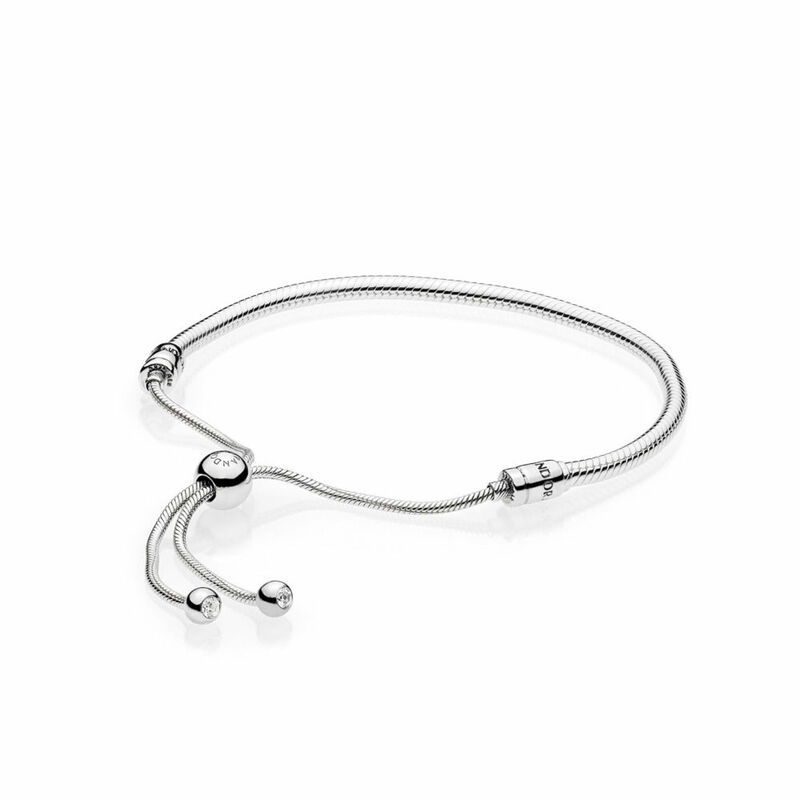 The new Sterling Silver Sliding Bracelet is only available in 28cm and has an interesting boho vibe! 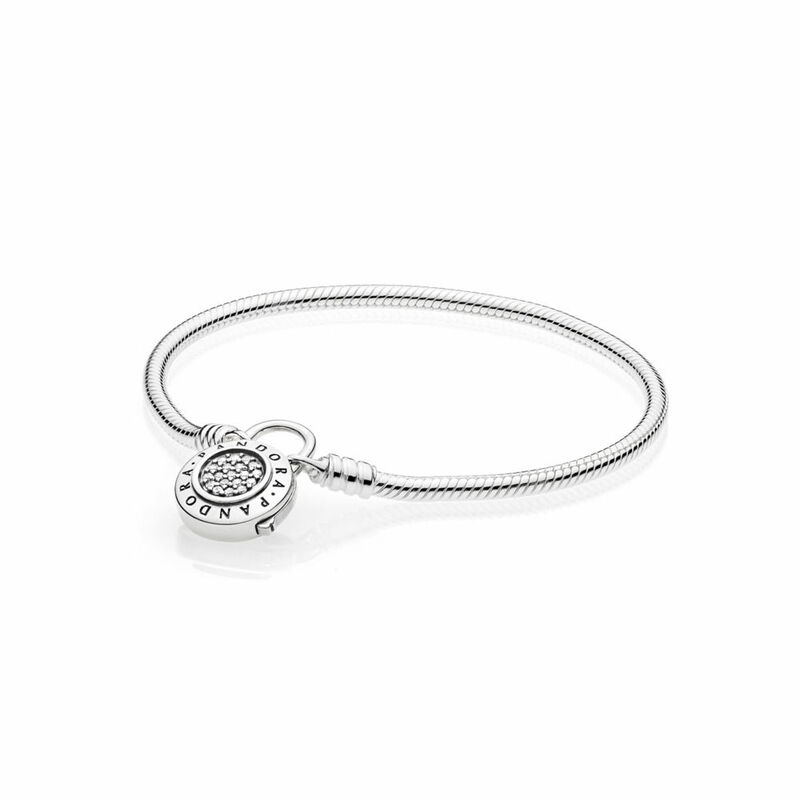 The padlock clasp features the PANDORA logo and is embellished with clear stones for a hint of shine. 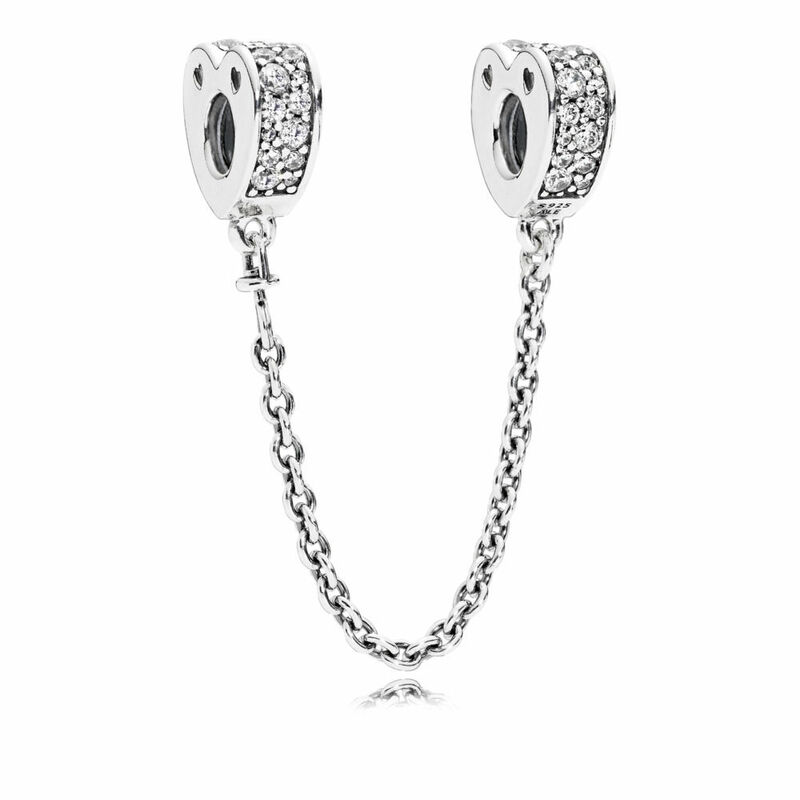 As the padlock is detachable you can change your look and swap the clasp with others in the collection. Available in 16cm to 23cm. 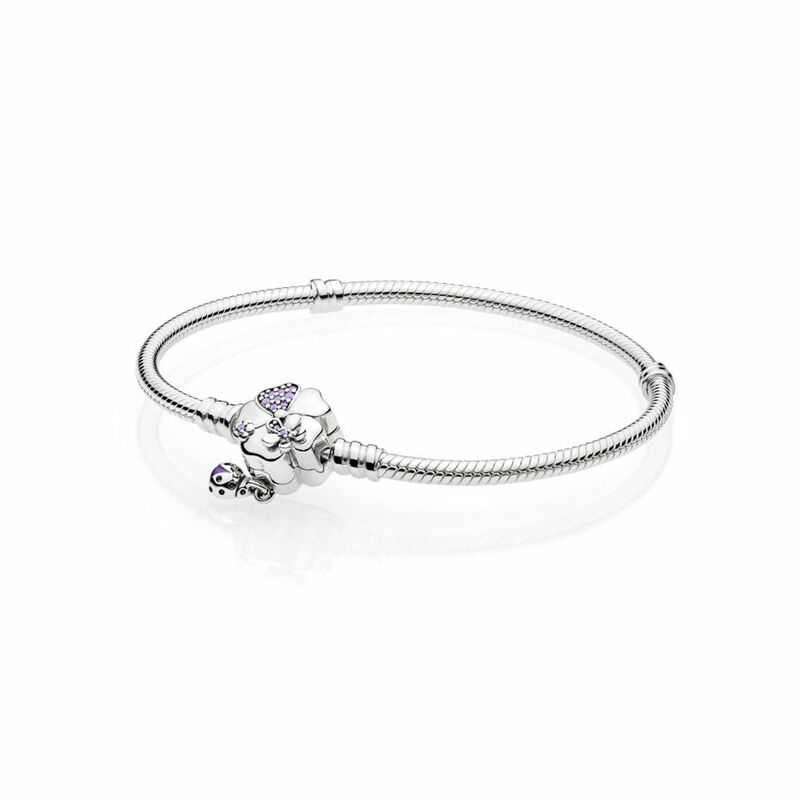 Detailed with a floral stone-studded clasp and an cute ladybird, this silver charm bracelet is very feminine. 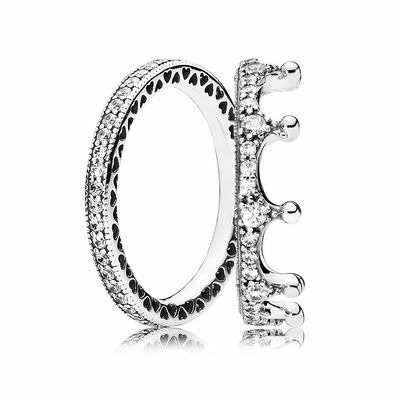 The Enchanted Crown Ring with its clear cubic zirconia is quite sweet and I think would look lovely worn in a stack. The Chandelier Droplets Ring with its dangling heart shaped stone in the centre is quite sweet. 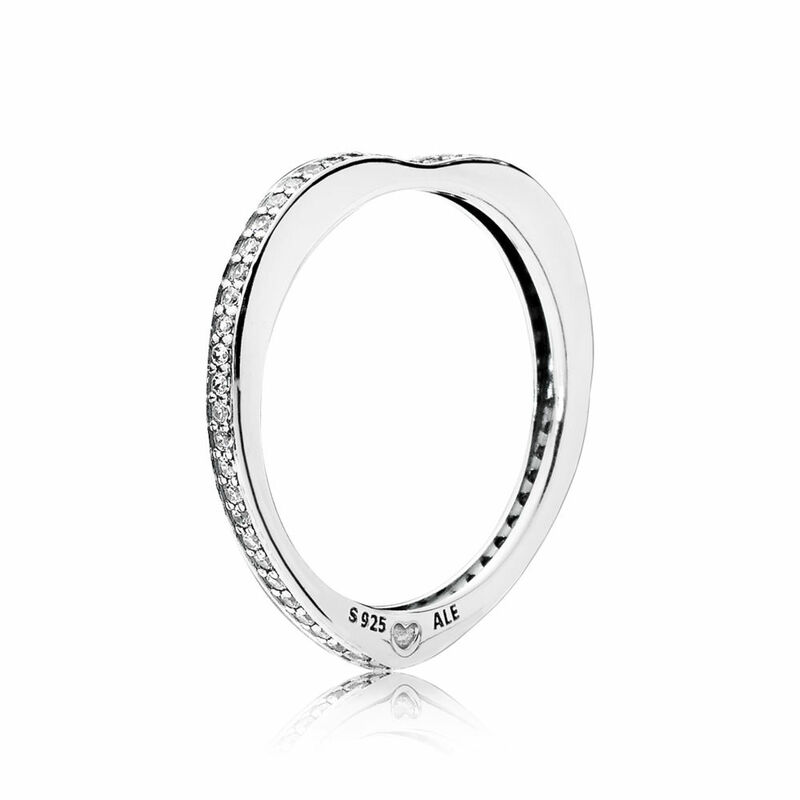 The Swirling Droplets Ring is simple yet very pretty and would look lovely in a stack. There is also a cute line of love hearts stamped on the inside of the band which is charming! 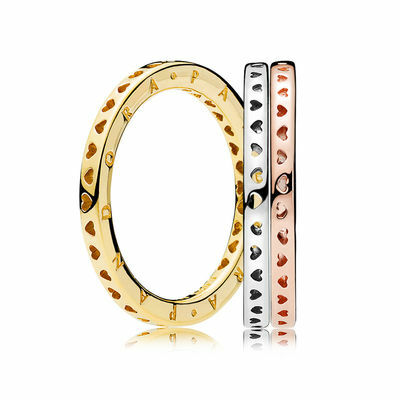 The Signature Hearts of PANDORA Ring and has little cut out hearts on the top of the ring rather than the side. 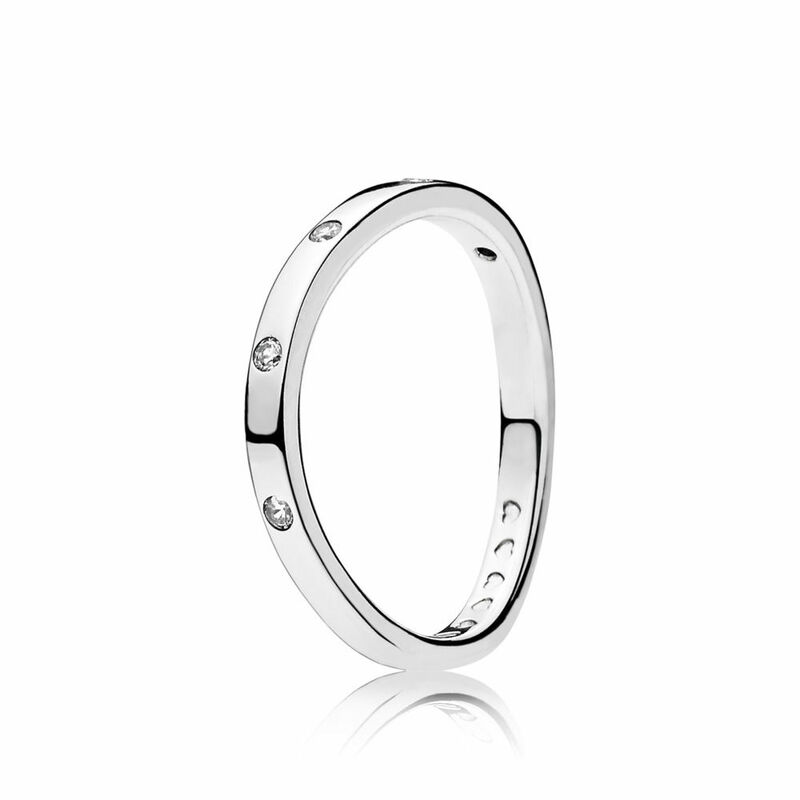 Inspired by the calming movement of waves, this gorgeous sterling silver ring is embellished with clear stones that lap around the ring. I love dragonflies and am pleased to see them featured in this collection. 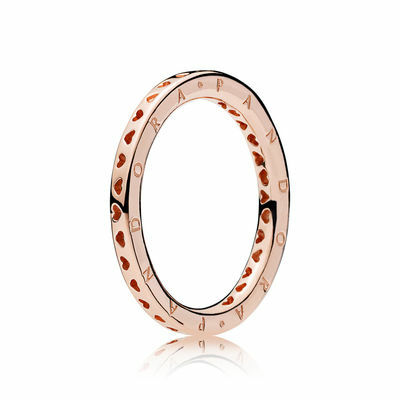 The abstract heart pattern of the Heart Swirls Ring creates a sweet girly style. 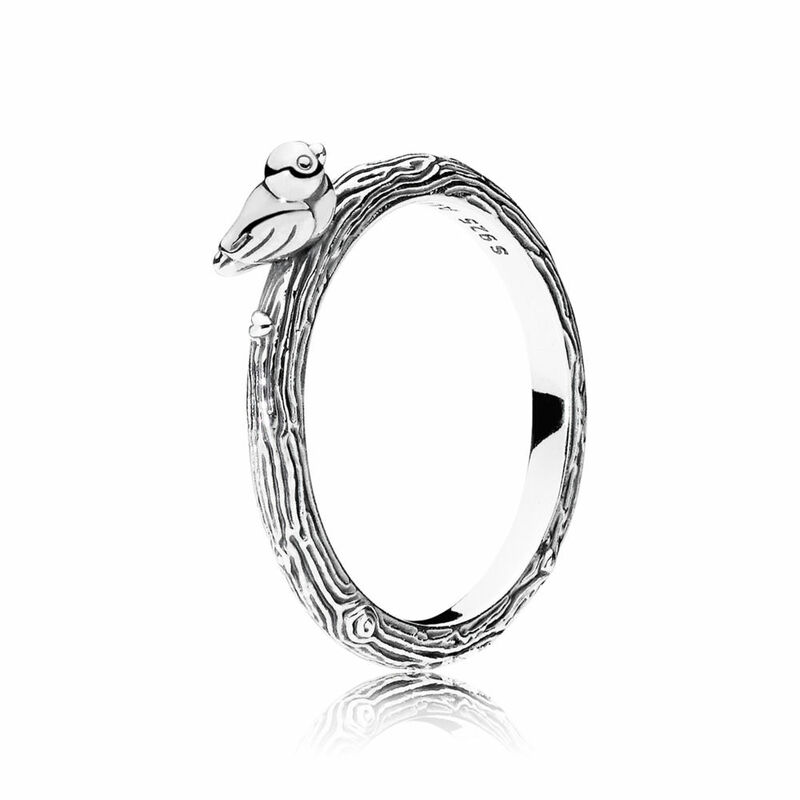 The Spring Bird Ring depicts a little silver bird sitting on a branch. 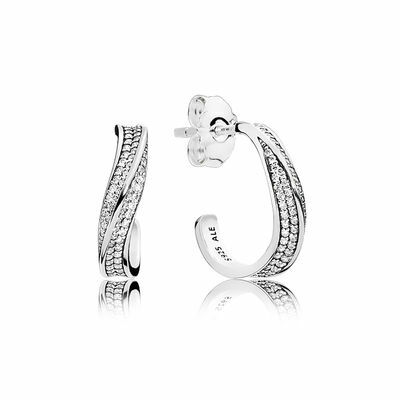 This range is incredibly beautiful and is exactly what I had hoped PANDORA would go back to producing; plain silver designs with intricate detailing. 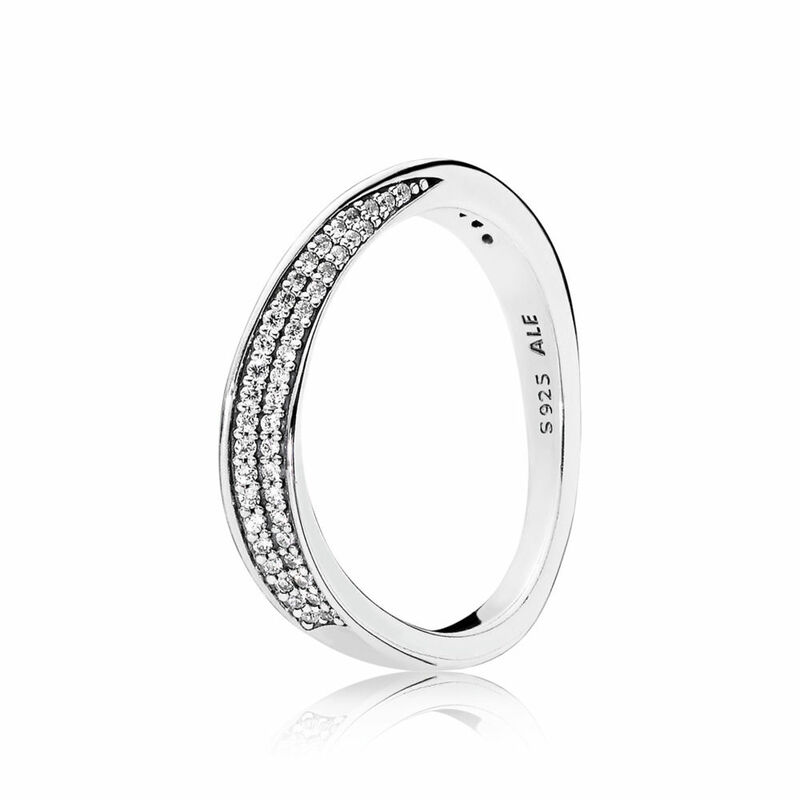 The Rainbow Arc of Love Ring is an eternity ring with a unique heart-shaped profile will dazzle on your finger. Available for a limited time only. 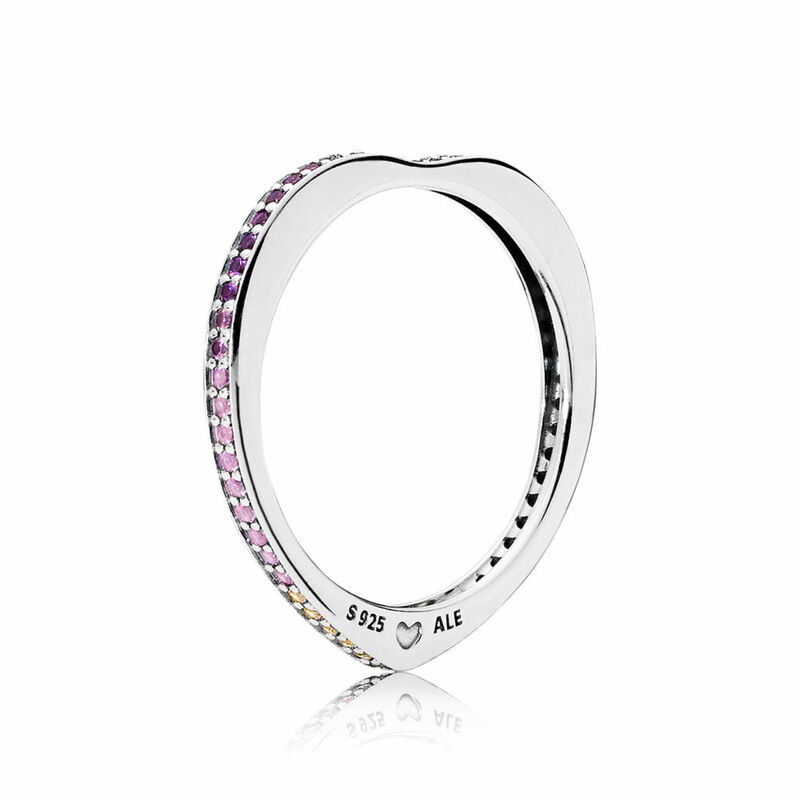 The Sparkling Arcs of Love Ring is more subtle than the multi coloured version. 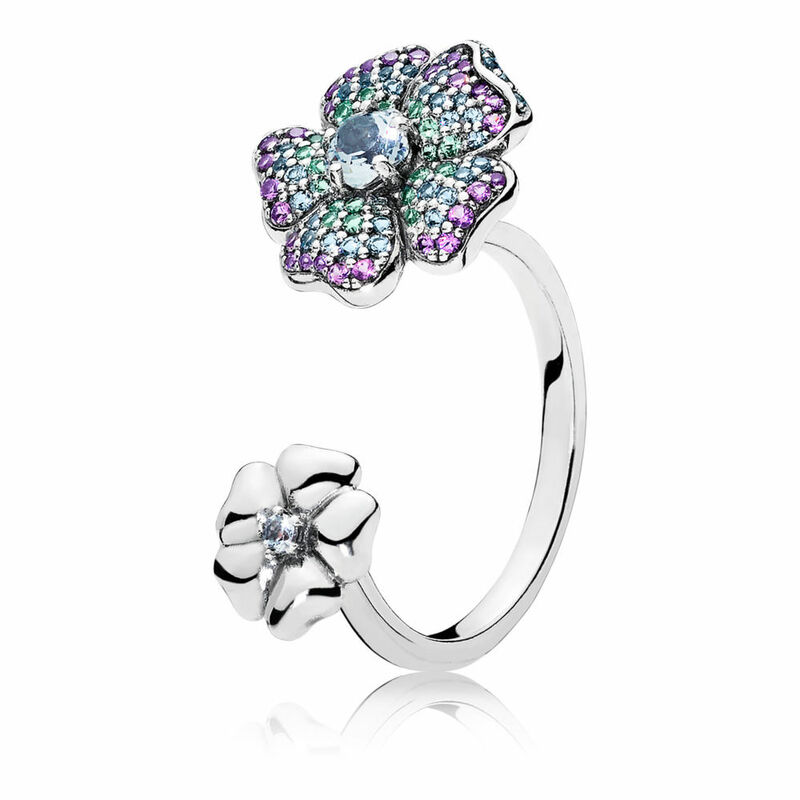 The Glorious Blooms Ring with its multi coloured crystals is interesting but is a bit too fancy for my taste. It seems that we are going back in time in 2018 as both choker necklaces AND brooches are back in fashion! The vibrant Glorious Blooms Pendant doubles as a brooch so you can choose how you wear it. 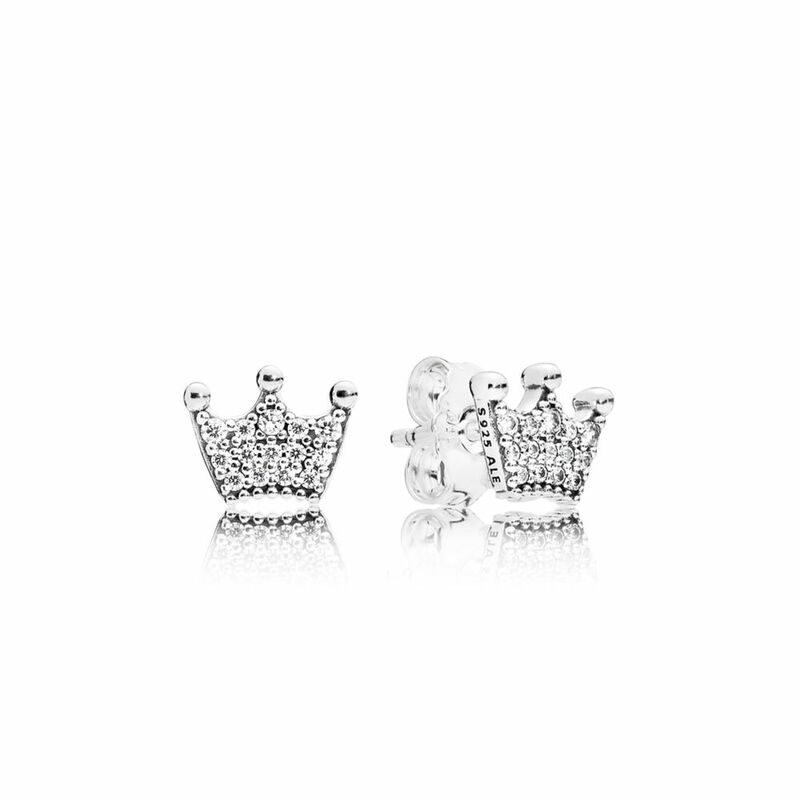 We can all feel like a queen and join the royal wedding fever with these elegant crown earrings! 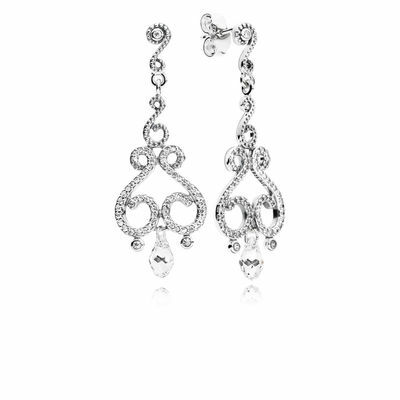 Style like a celebrity with these stunning Chandelier Earrings with clear crystals and cubic zirconia stones. I am predicting this design to be a favourite as hoop earrings are one of the trends for 2018. 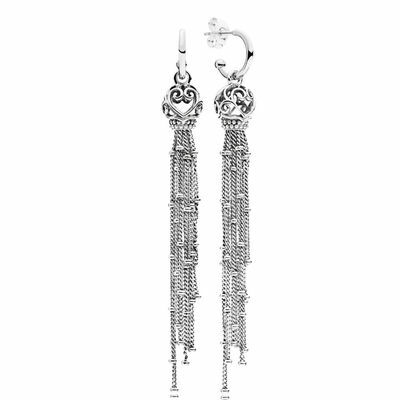 The Enchanted Tassels Earrings are the ultimate statement earrings and are perfect for a special night out. 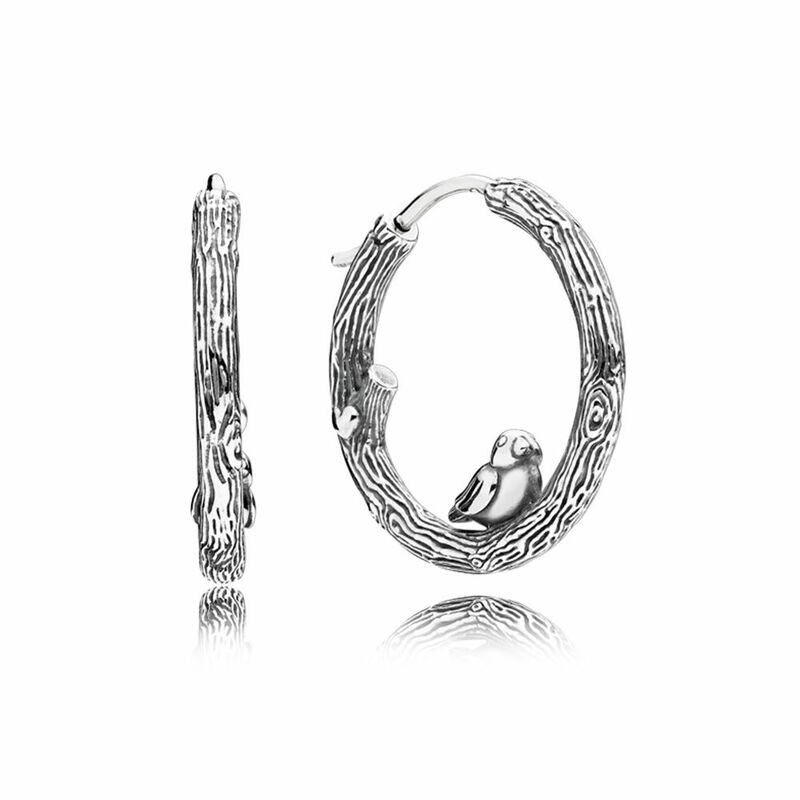 The Limited Time Spring Bird Hoops are similar to the ring design but with the bird sitting inside of the hoop. 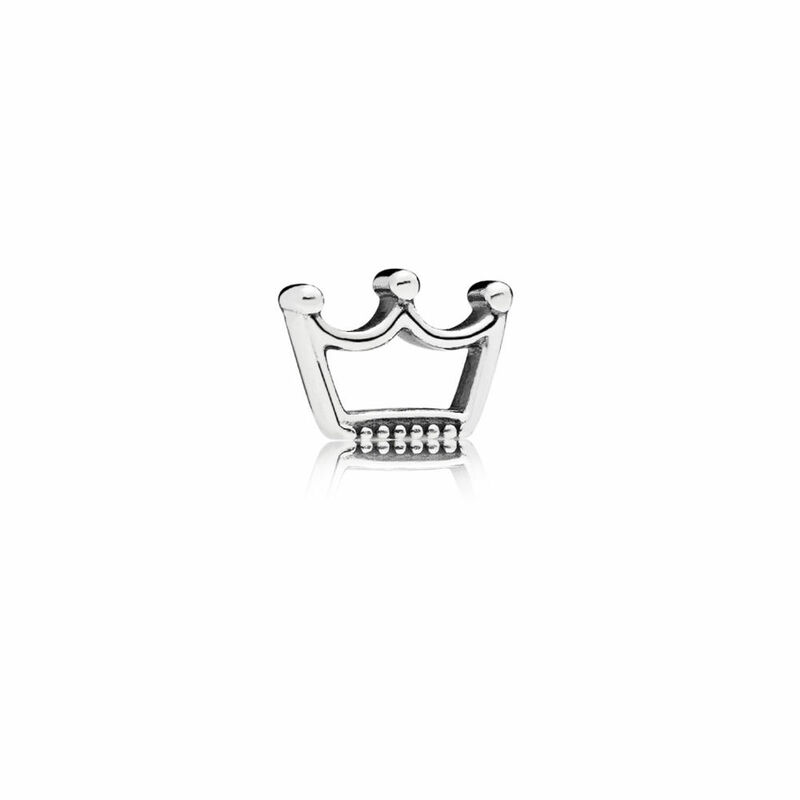 I love this design and am interested to see how big they are as I normally prefer to wear stud earrings. 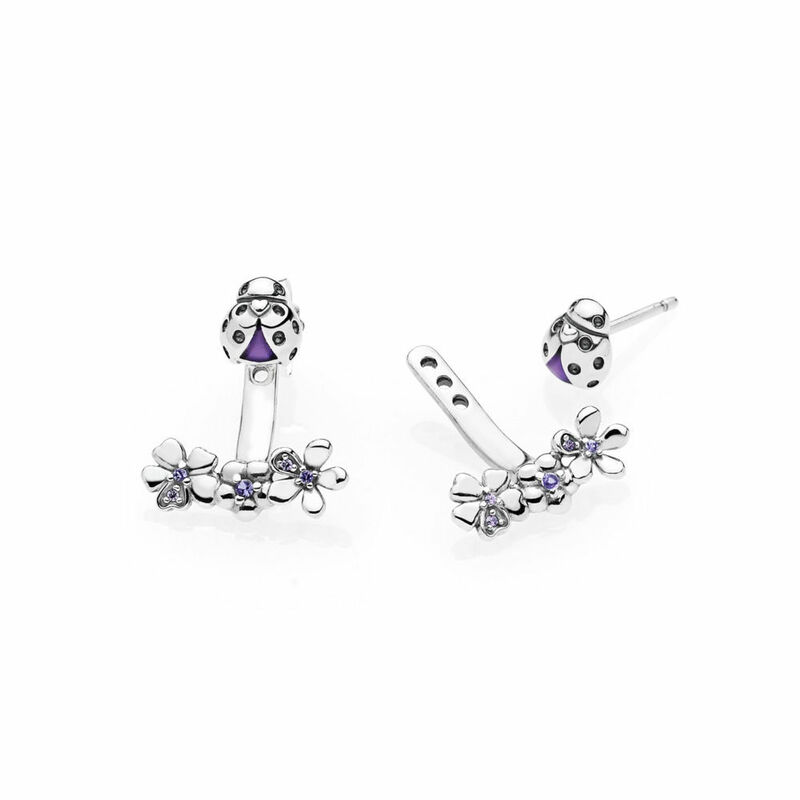 The Ladybird Meadow Earrings can be worn with or without the jacket for two different looks. The jacket drop is adjustable, so you can personalise your looks. 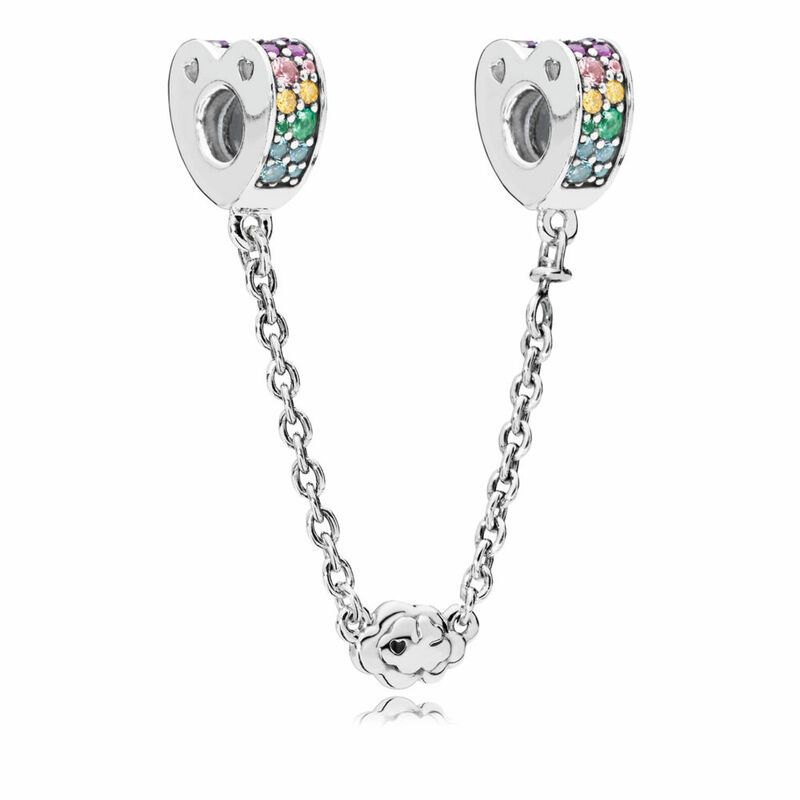 The Limited Time Rainbow Arcs of Love Stud Earrings are a perfect match to the necklace. Notice the purple stone is a heart shape, which is a cute detail. The arch shape will look really sweet on the ear lobe and will make a charming day time style. The Chandelier Droplets Necklace features a waterfall of luminous clear heart-shaped and round stones and a classic drapery style that is suitable for day and night. 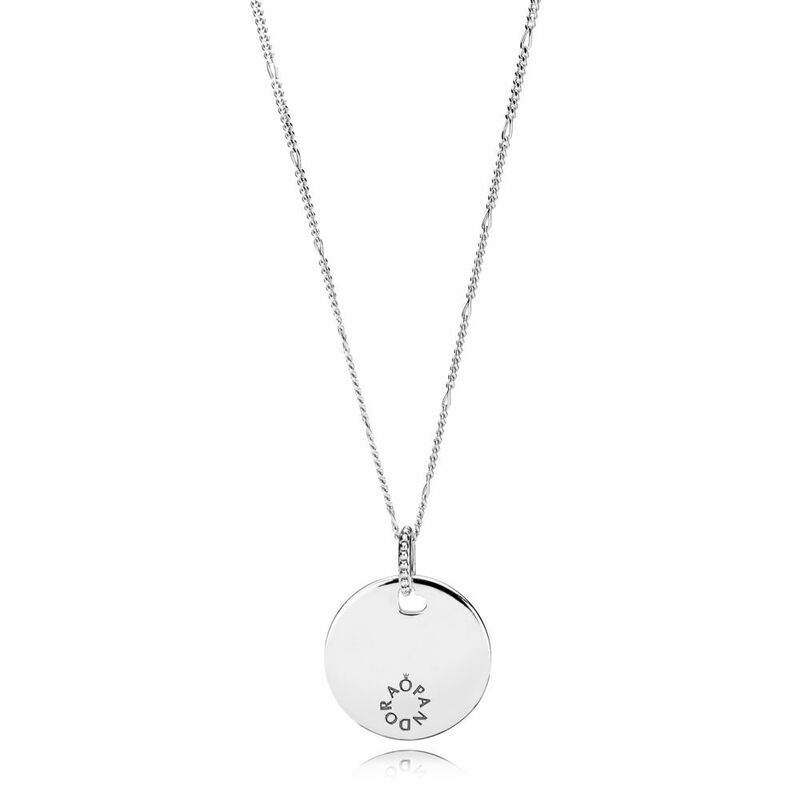 With a minimalistic design that features a sweet heart cut-out and a polished disc which can be engraved, this necklace is an everyday style staple. 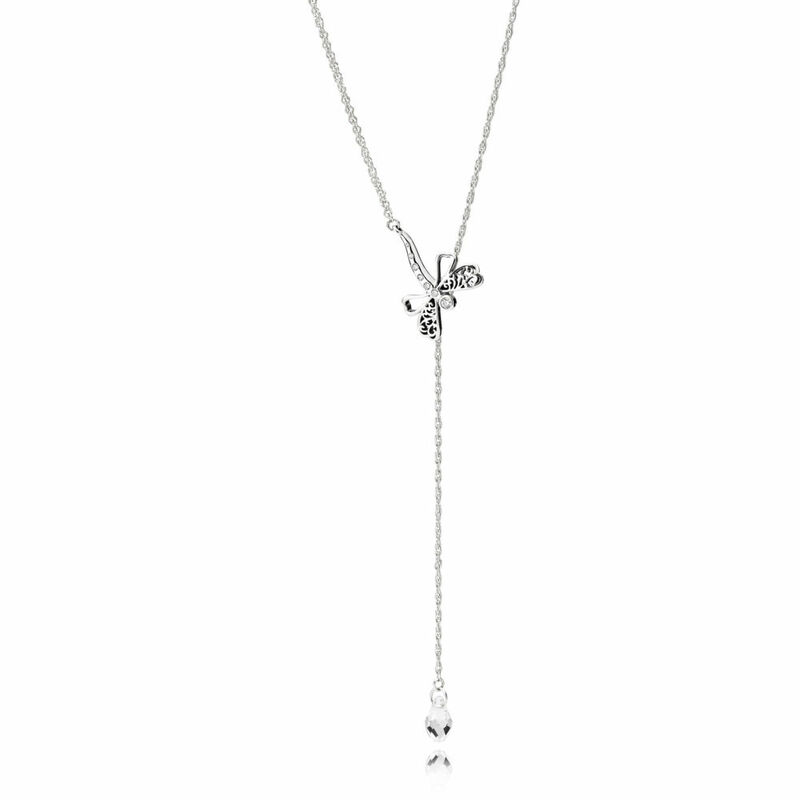 The 60cm necklace chain can be adjusted to 50cm and 40cm. 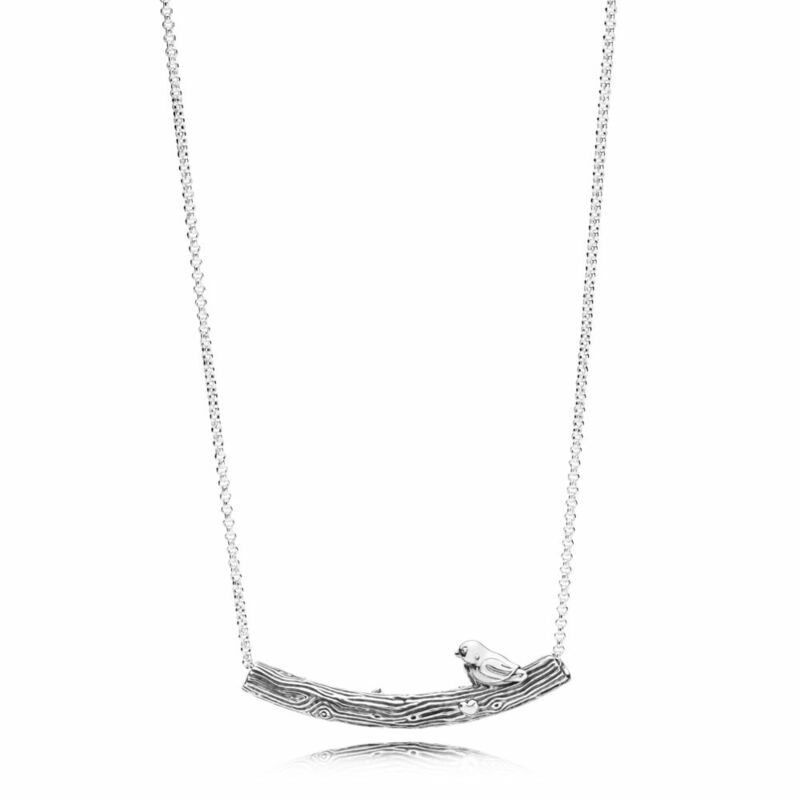 This dream necklace has a dragonfly that swoops around your neck in a graceful line. The 65cm chain can be adjusted to your desired length. I haven’t worn a choker necklace for years but this design is really quite pretty. I think perhaps rather than wearing it as a choker I would wear it in my hair or across my forehead in a hippy style. Get your glam on with the Enchanted Tassel Necklace! The embellished crown and shimmering tassels of the enchanting 8cm pendant will make a real statement! 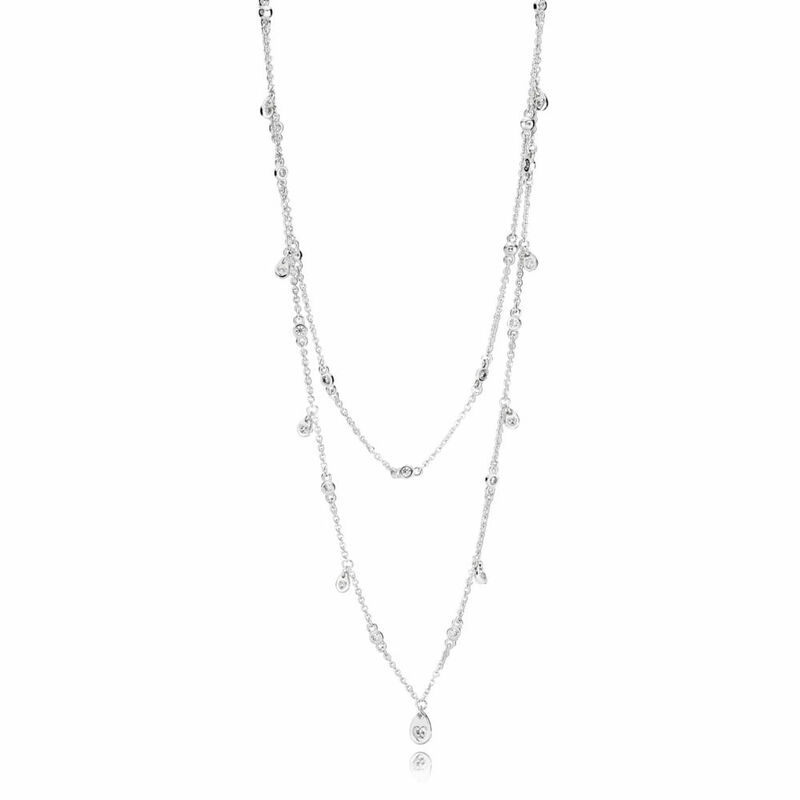 The 70cm chain is adorned with stones for an extra hint of sparkle and can be adjusted to suit your neckline. The Limited Time Spring Bird Necklace is both unusual and charming and shows a silver bird sitting aloft an arc shaped branch. 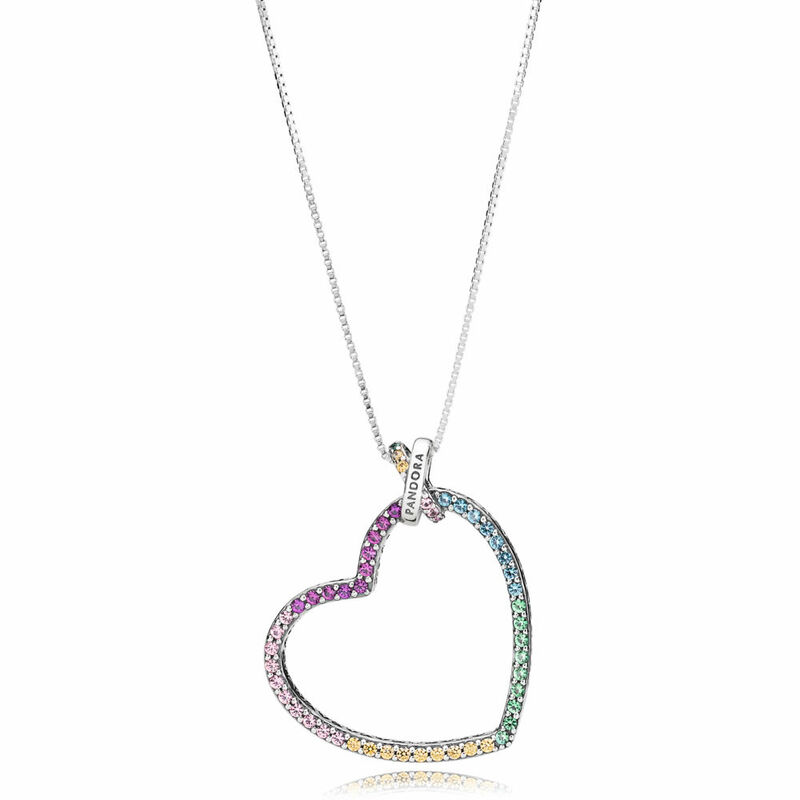 I quite like the colours of the Limited Time Rainbow Heart Necklace and the little ‘x’ shaped bale is rather sweet too. 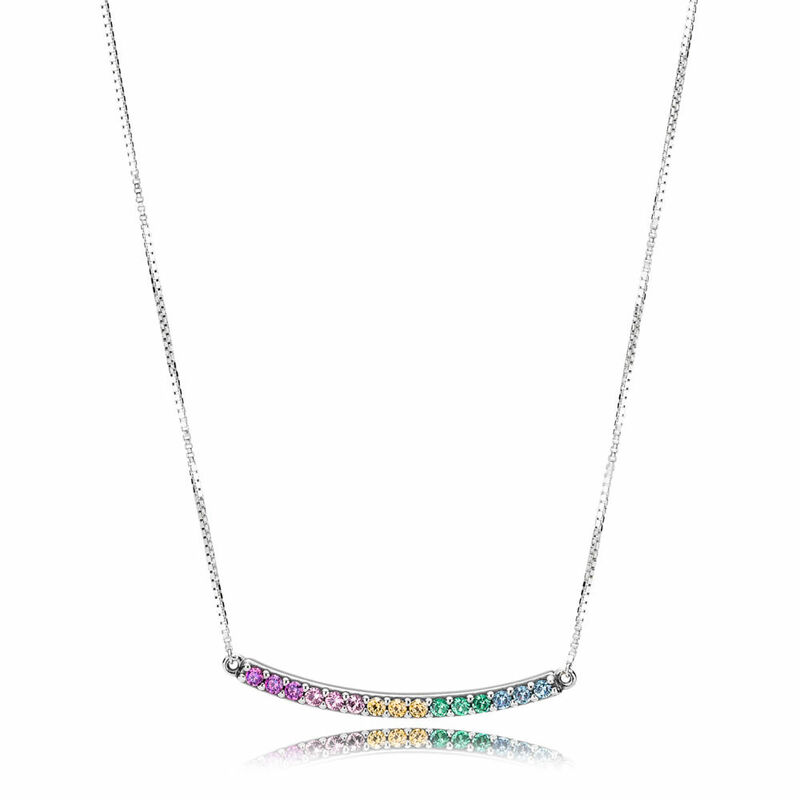 The Limited Time Rainbow Arcs of Love Necklace also features the same rainbow themed stones but in an arch shape. 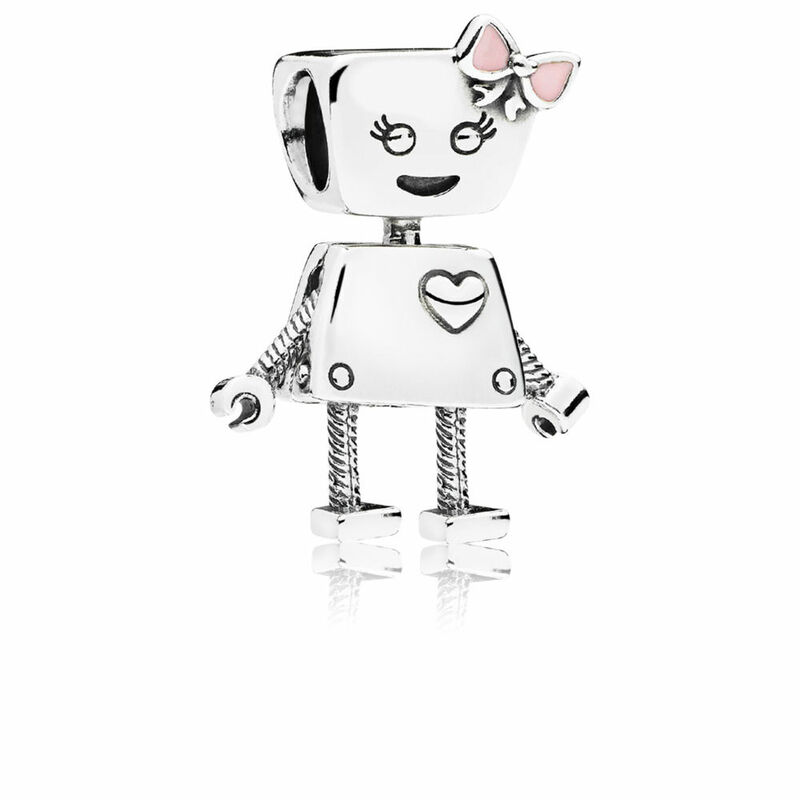 The PANDORA Rose Bella Bot Charm is as cute as the silver version. I think they are both must-haves! 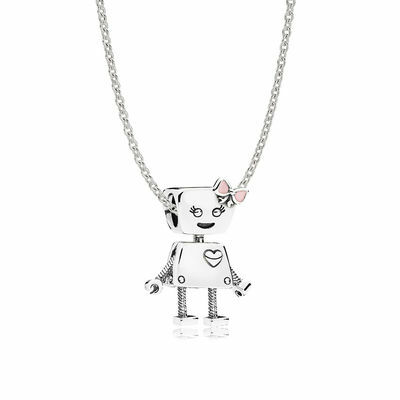 Available with a exclusive Limited Edition Bella Bot gift box. 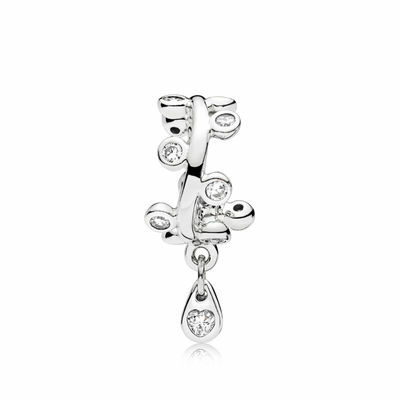 This whimsical charm spells out “happy” to remind to always be positive. A wonderful gift to give someone who brings you happiness. 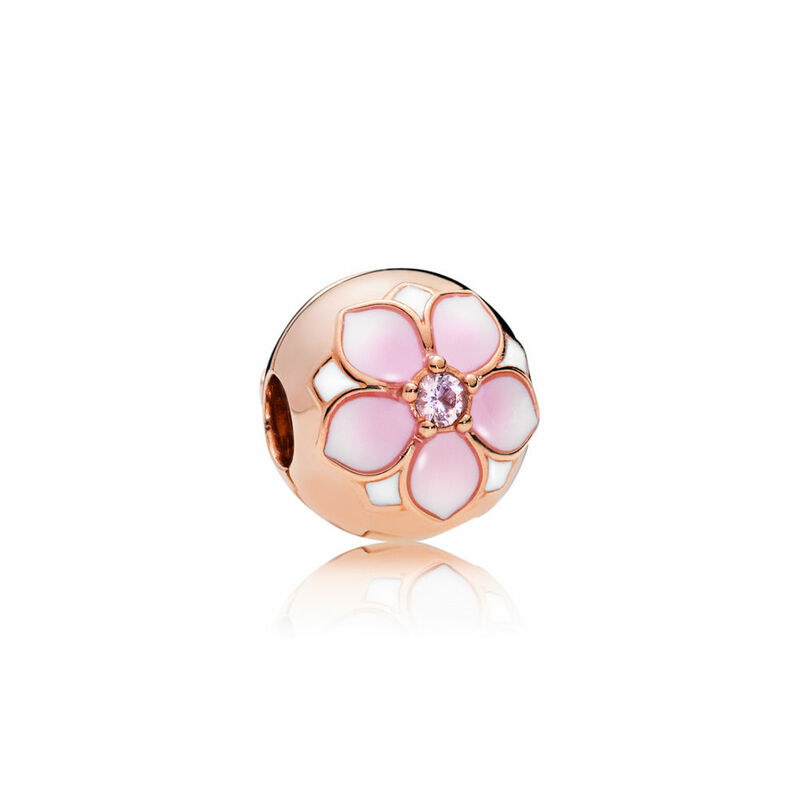 At first I wasn’t sure about the combination of pink enamel with PANDORA Rose but now I find it really pretty and it reminds me of cherry blossoms. 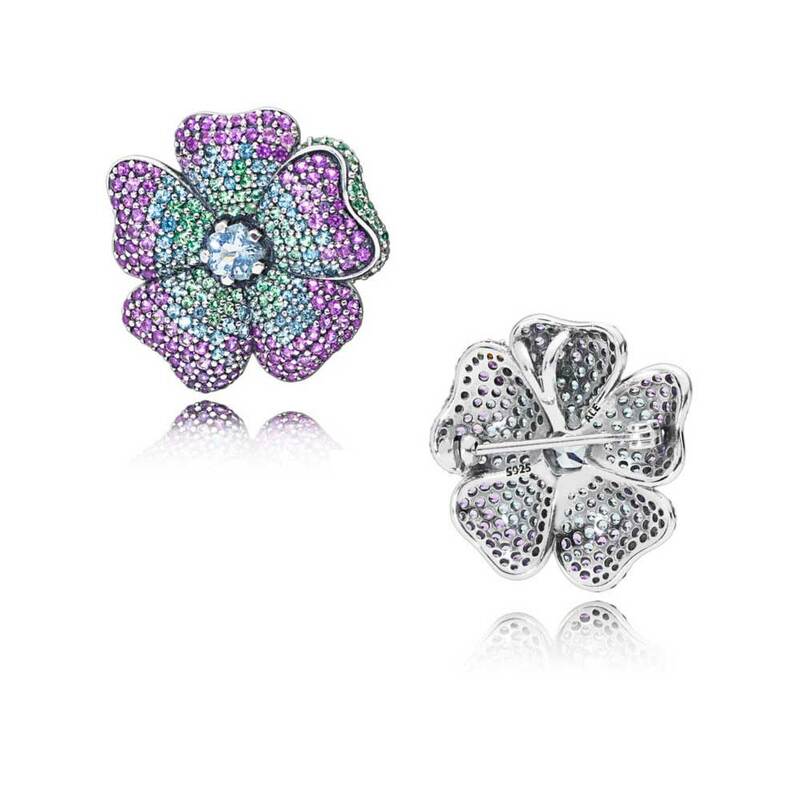 I love my silver Magnolia Bloom Clips and the PANDORA Rose versions are equally beautiful. 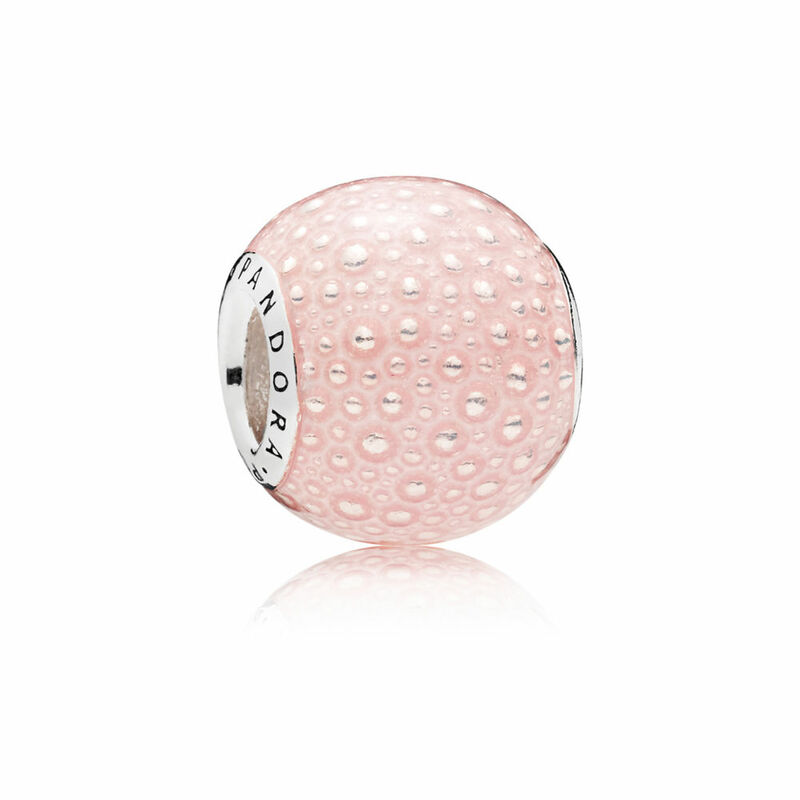 The romantic pink enamel acts as a reminder of the warm feeling of summer and spring. 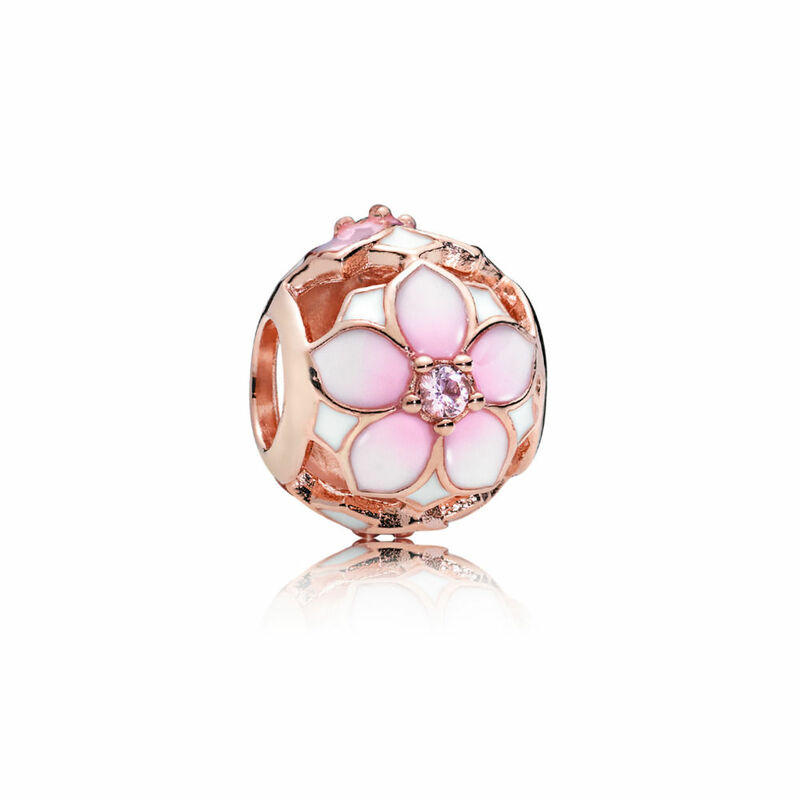 A hanging ladybird, pink and honey-hued stones, pale pink enamel and the luscious pink hue of the unique blend of metals of PANDORA Rose create a beautiful snapshot of a garden. 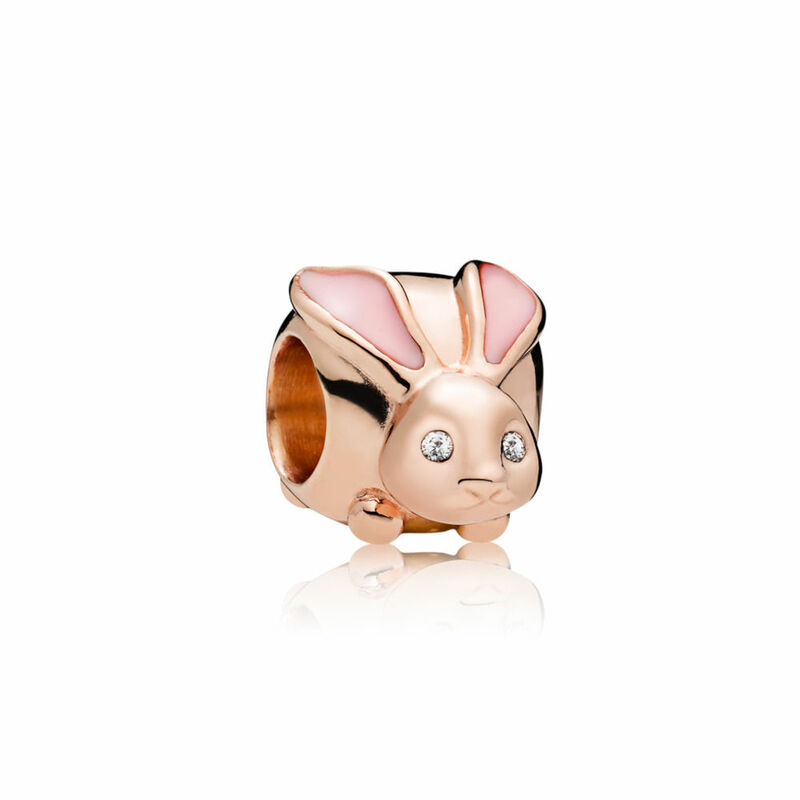 Adorned with pale pink enamel ears and sparkling eyes, this charm shows imaginative spirit and a readiness for adventure. 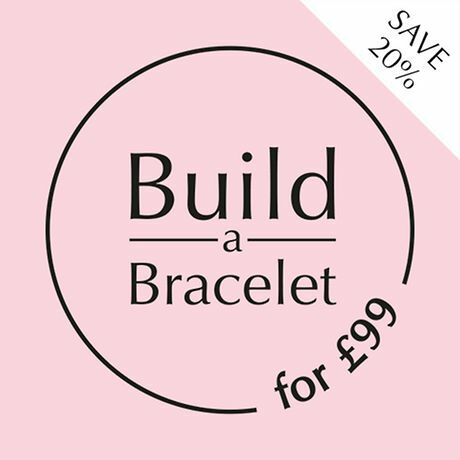 You can create multiple looks with the new Sliding Bracelet! 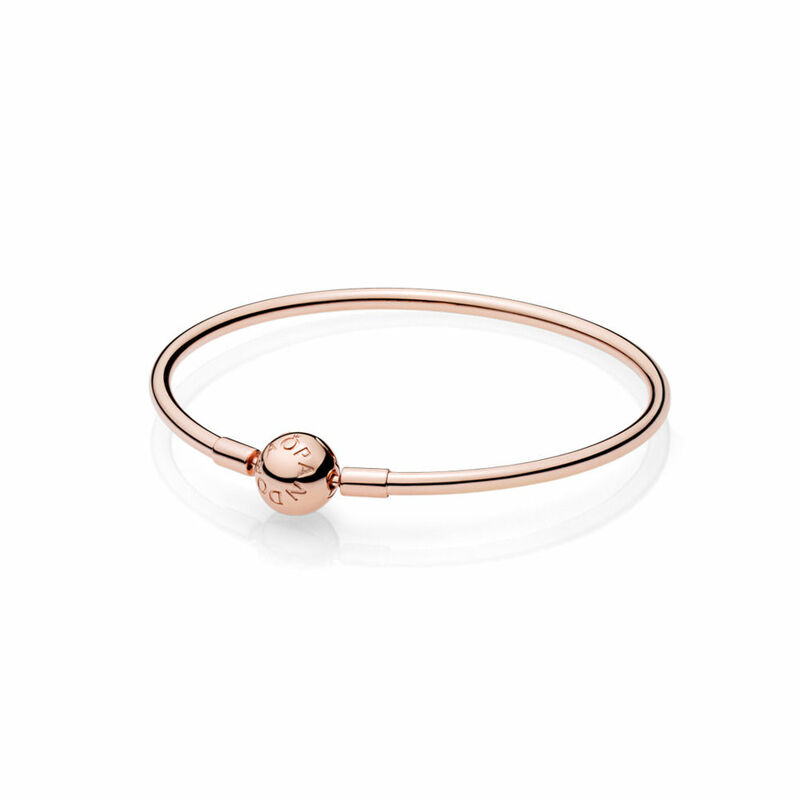 Swap the ends of the bracelet with others in the collection to create two-tone looks and personalise your style with charms. 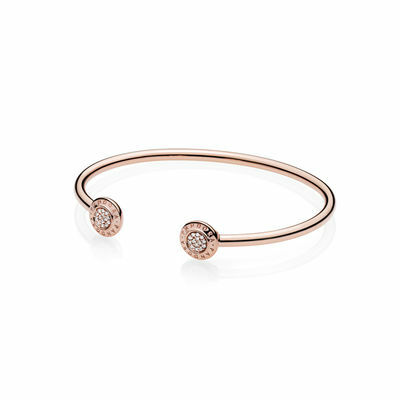 Stylish and oh-so feminine this PANDORA Rose Bangle will look stunning on its own or stacked. 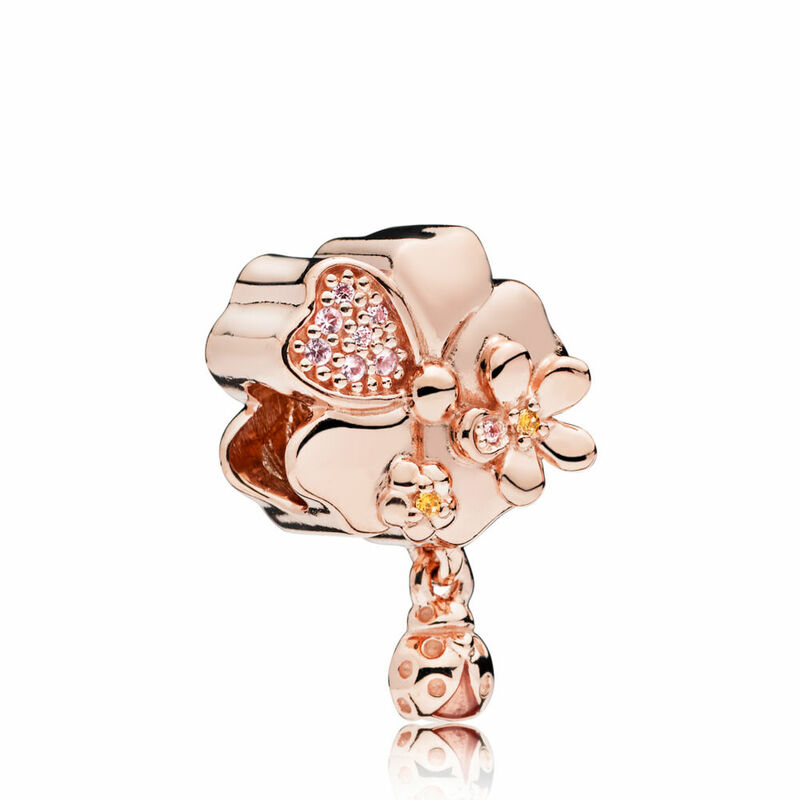 A new PANDORA Rose take on a classic PANDORA Signature style. 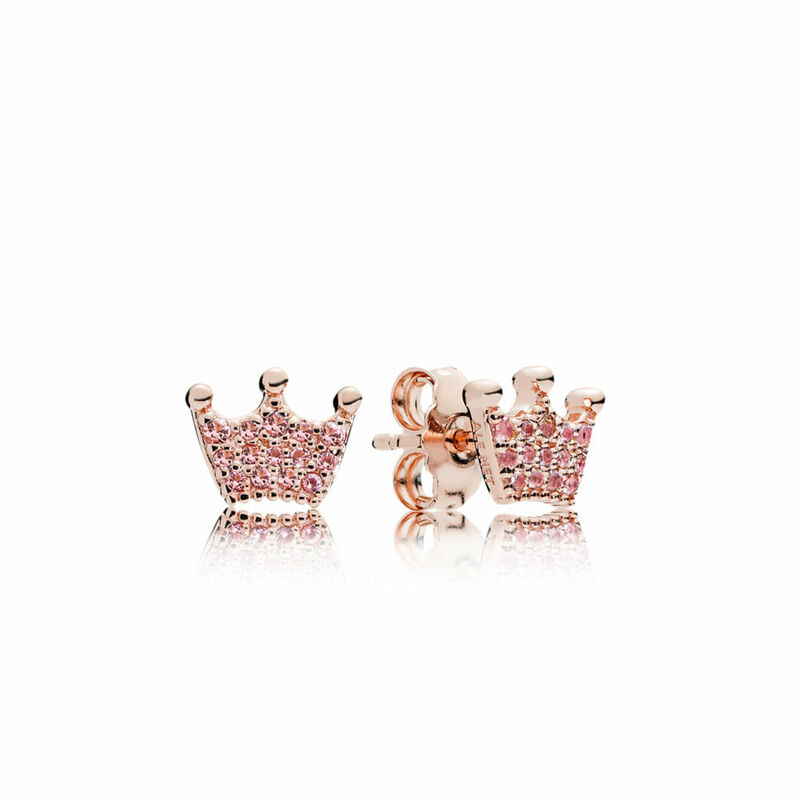 These PANDORA Rose Pink Enchanted Crown Earring Studs are an ideal girl for a little girl or would look cool worn mismatched with other studs earrings. These gorgeous drop earrings feature cascading embellishments of tonal pink stones that will catch the light when you move. 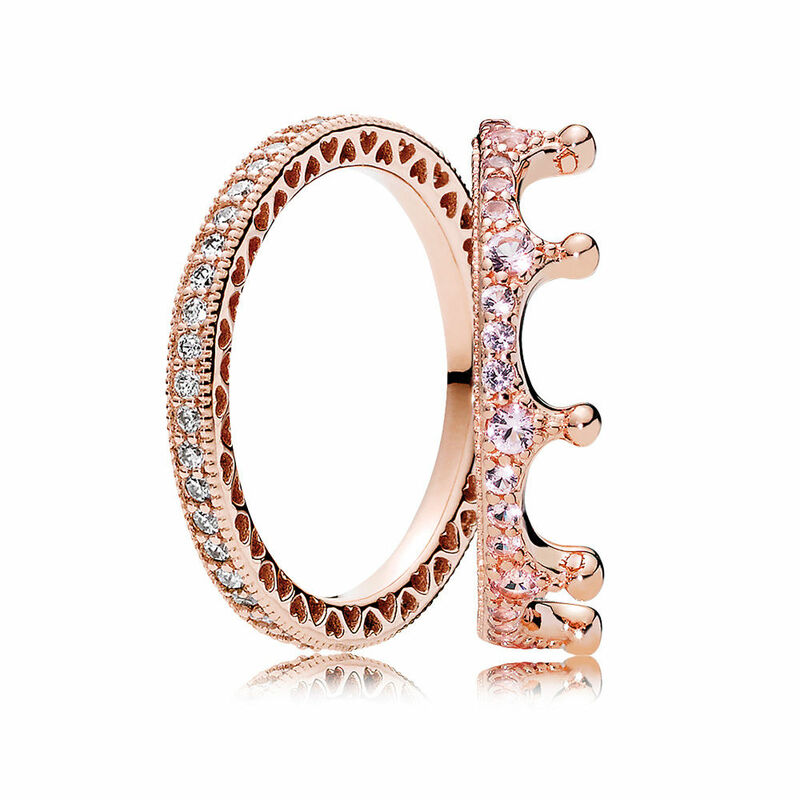 The radiant hue of the PANDORA Rose Pink Enchanted Crown Ring is complimented by gleaming orchid pink and blush pink crystals and looks awesome stacked with the silver version. The finely crafted pattern of cut-out hearts and the classic logo details express vibrancy and flair! 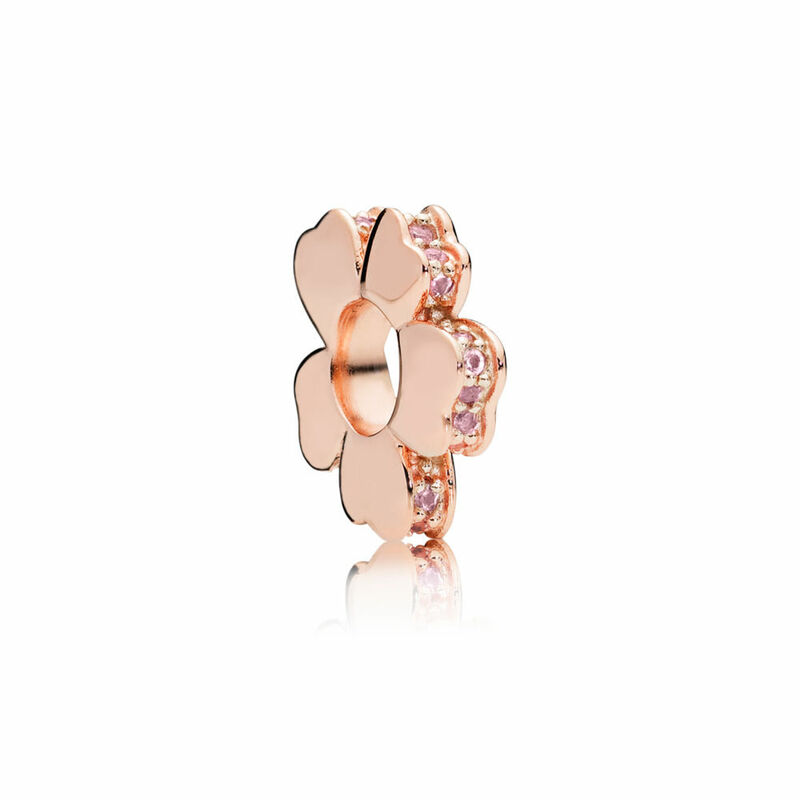 The PANDORA Rose ring with its warm hue is complimented by shimmering pink and honey-coloured stones. 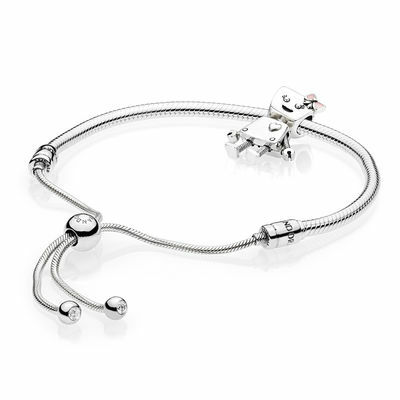 The fun Bella Bot gift set includes the Silver Moments Sliding Bracelet and the Bella Bot Charm. 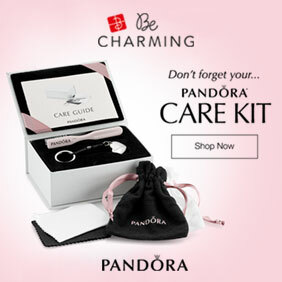 This cute gift set includes the PANDORA Rose Moments Sliding Bracelet and the PANDORA Rose Bella Bot Charm. Choose from either a 45cm, 60cm and 70cm necklace in this pretty gift set. 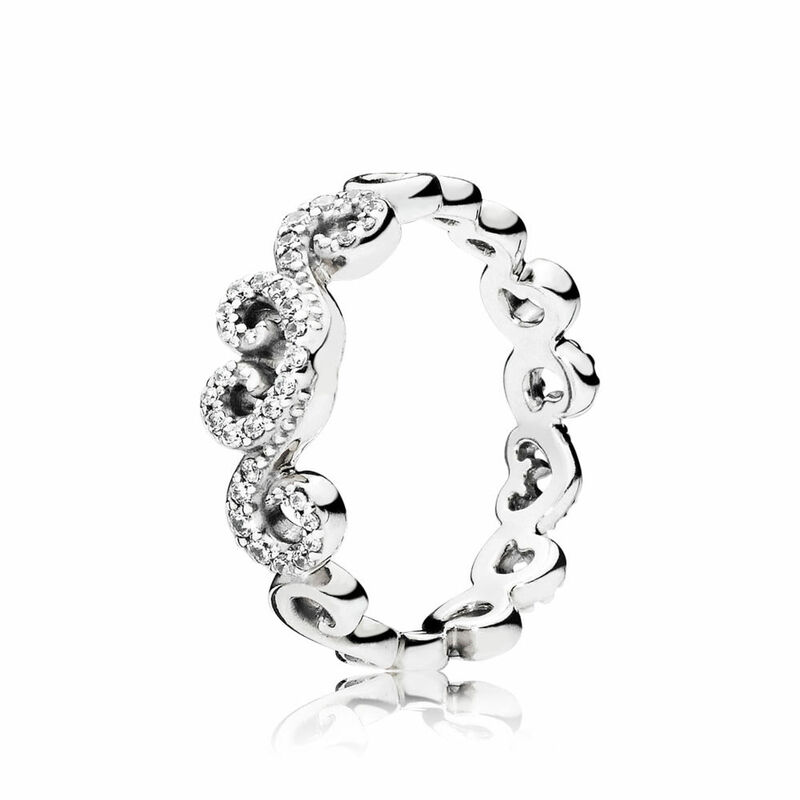 The Silver Enchanting Ring Stack gift set includes Enchanted Crown Ring and the Silver Hearts of PANDORA Ring. 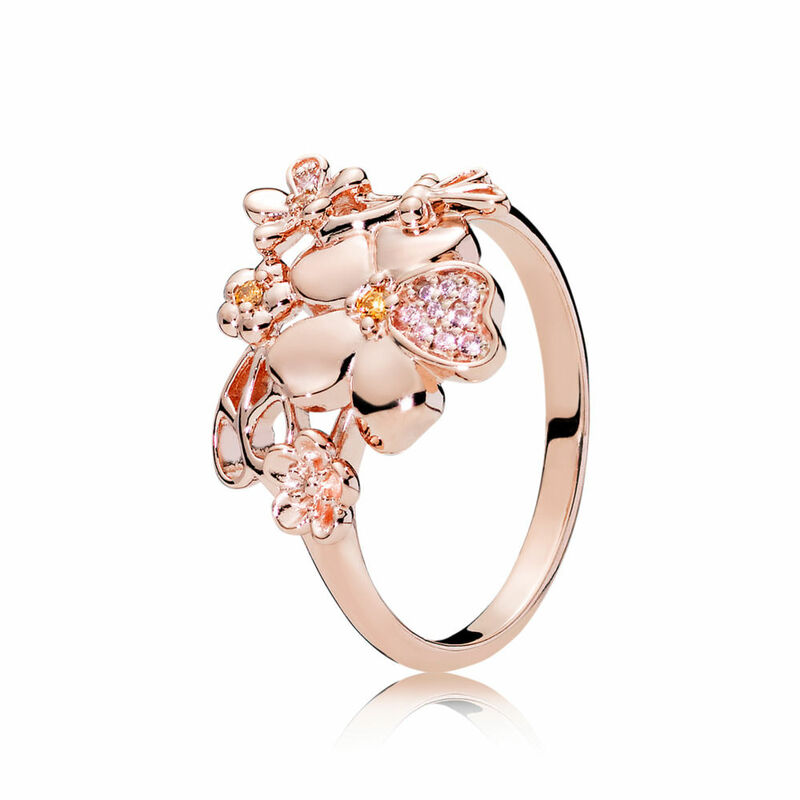 The PANDORA Rose Enchanting Ring Stack gift set includes PANDORA Rose Pink Enchanted Crown Ring and the PANDORA Rose Hearts of PANDORA Ring. 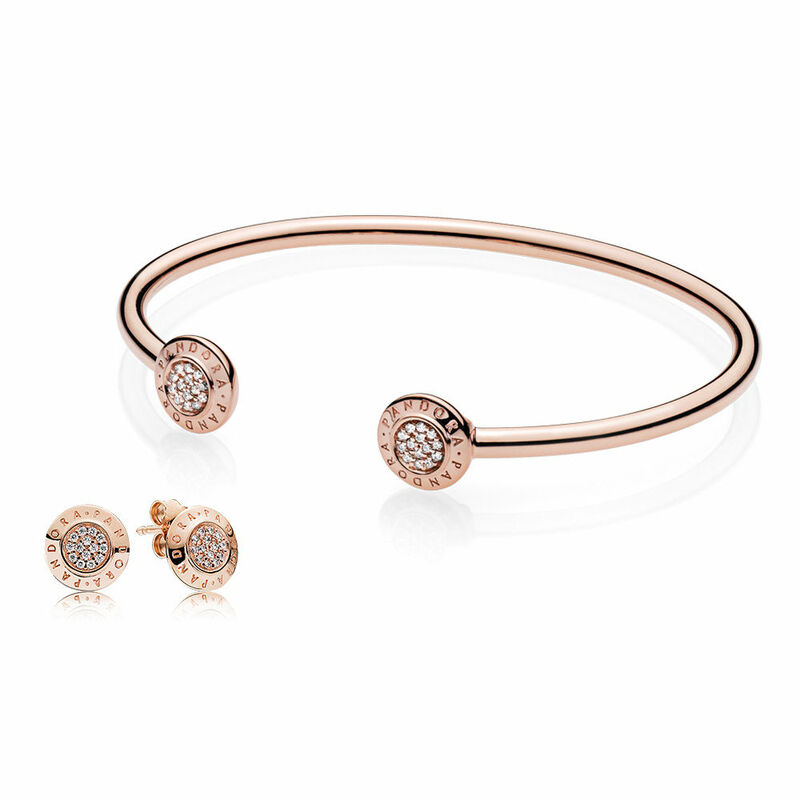 Gift set includes the PANDORA Rose Signature Bangle and PANDORA Rose Signature Earring Studs. Who says you have to chose? Mix your metals for an on-trend look this season with romantic heart cut-out designs in PANDORA Shine, PANDORA Rose and Sterling Silver! The Blue Ripples Open Bangle Gift Set includes the Open Bangle with PANDORA Logo Endcaps and the Blue Ripples Charm. 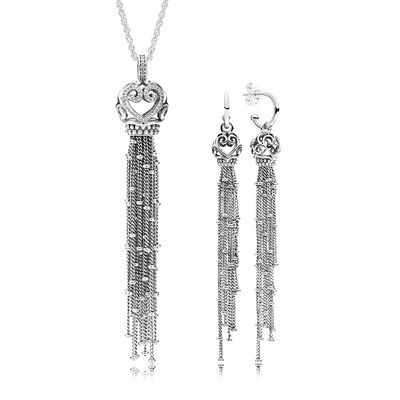 Gift set includes the Enchanted Tassels Hanging Earring Studs and Enchanted Tassels Necklace. 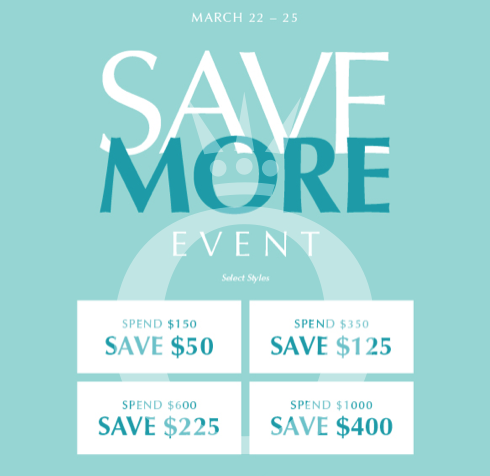 From 22nd – 25th March 2018 the more you spend on PANDORA the more you save! 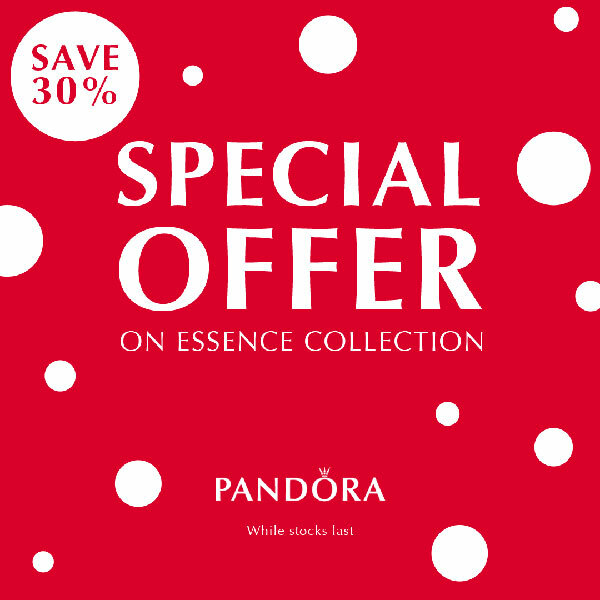 The PANDORA Save More Event will include the Spring 2018 collection apart from the new PANDORA Shine range. 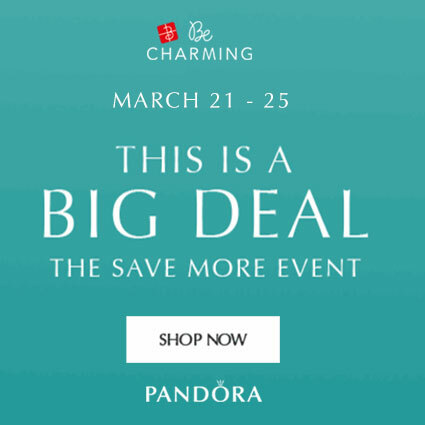 The PANDORA Save More Event is available in store, by phone on (800) 878-7868 and online at our preferred PANDORA retailer BeCharming.com. 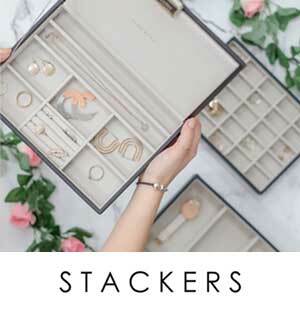 The PANDORA Spring 2018 collection has gotten me excited! My favourites from the collection include the Promise of Spring, Spring Bird House, Enchanted Garden Glass, Bella Bot, Perfect Pals, Enchanted Tea Pot, Enchanted Heart Tassel, Dreamy Dragonfly, Enchanted Heart Clip and Blue Ripples. 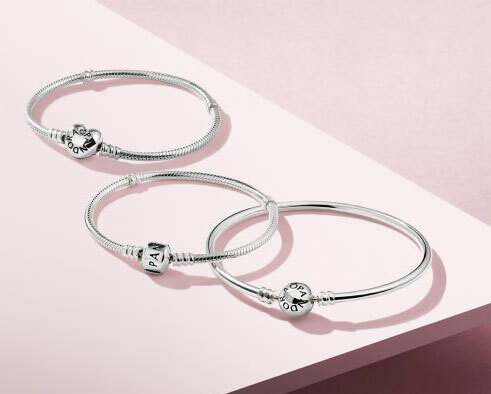 The PANDORA Spring 2018 Collection is available from our preferred PANDORA retailer BeCharming.com. What are your thoughts on the PANDORA Spring 2018 Collection? Are any of the items must-haves for you? Let us know in the comments below! Thank you for the lovely preview. The Spring collection looks lovely. I’m liking the look of enchantment in that lovely peachy pink colour, enchanted nature and dreamy dragonfly. You are most welcome! I think the Spring Collection is lovely too! I love the texture of the Enchantment charm and both colours are really pretty. I’m so pleased to see Dragonflies in the collection too and I really like the Dreamy Dragonfly. I think I would like to see more images of the other charms with dragonflies before I make up my mind on them though. 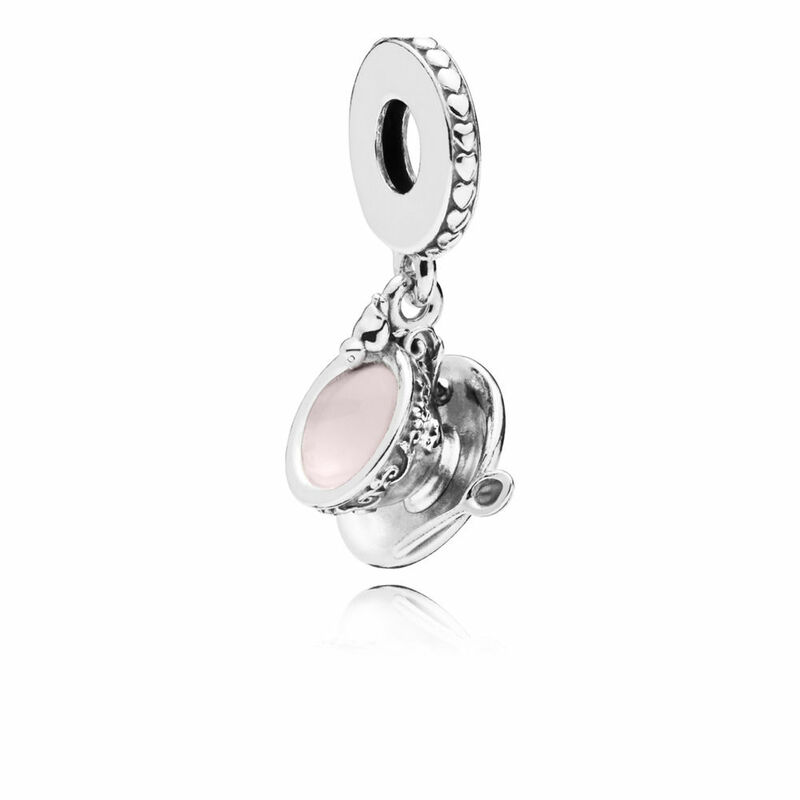 I haven’t seen any two tone charms in this selection but maybe there will be some. 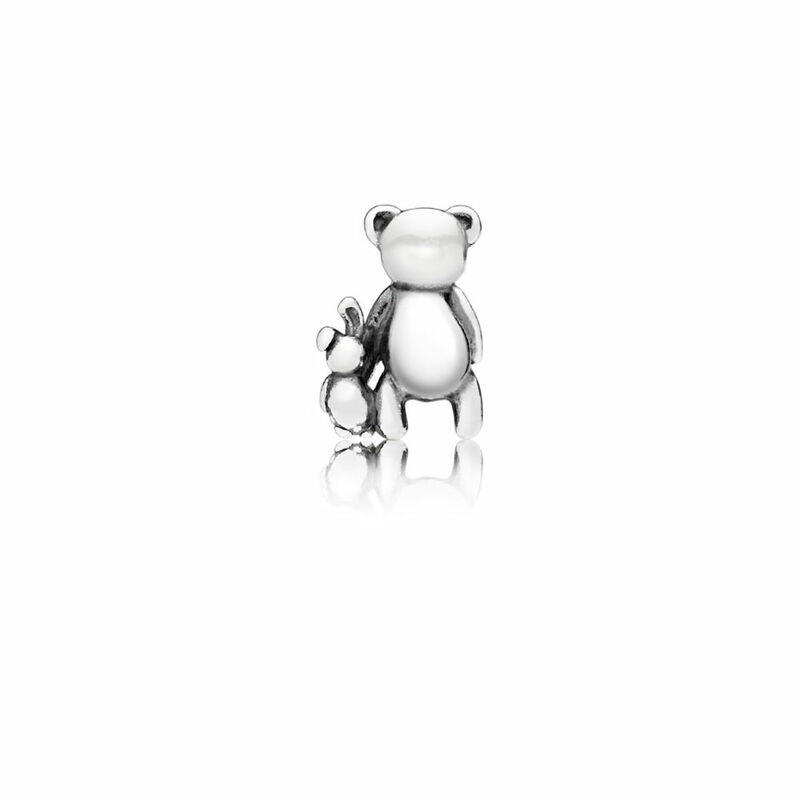 There were a new selection on 18k gold plated charms in the PANDORA survey so maybe that is why we aren’t seeing so many two tones. I hope it’s not the end of them though, as they are often my favourites! My feelings exactly! 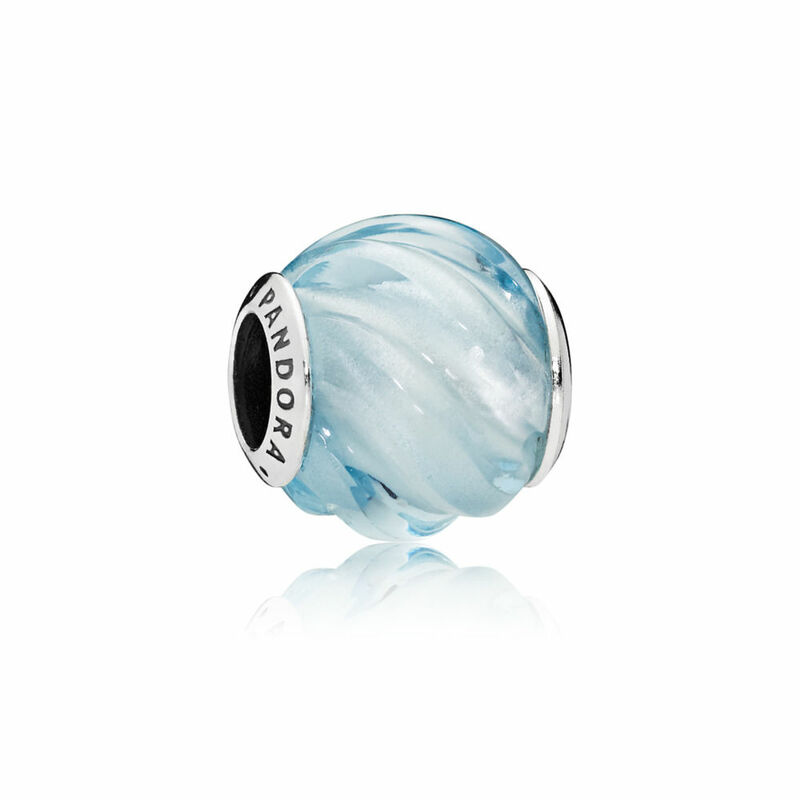 I’m feeling excited about PANDORA again and it’s nice to see so much variation in the collection! Your must have list sounds perfect! I think the only charms I’m not really keen on at all from this collection are the emoji charms and the wildflower range. I think we have been there and done that with the wildflowers and the colours of the cz stones are too much for me. 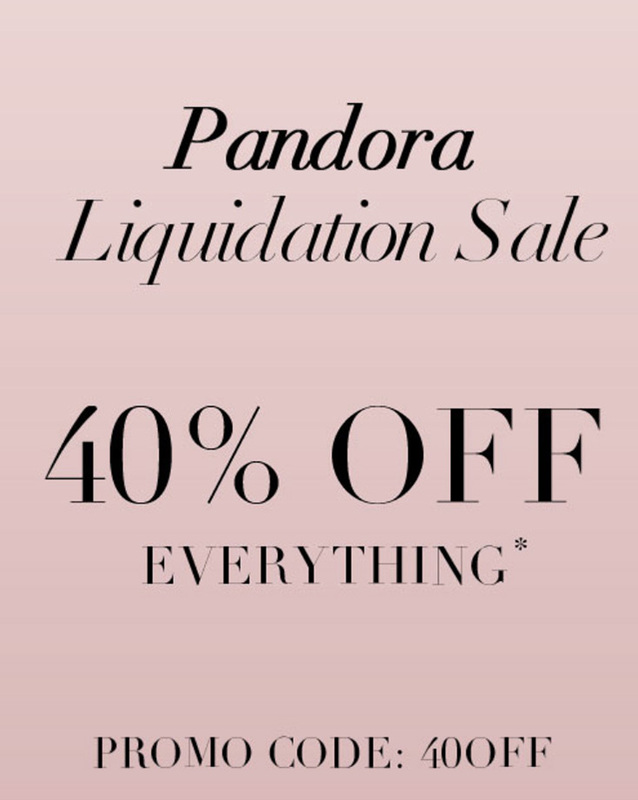 Not only are the pieces more like the old pandora, the prices are more reasonable.. Sure there are a few expensive charms, but many more than usual are reasonably priced. Looking forward to the collection! So true! 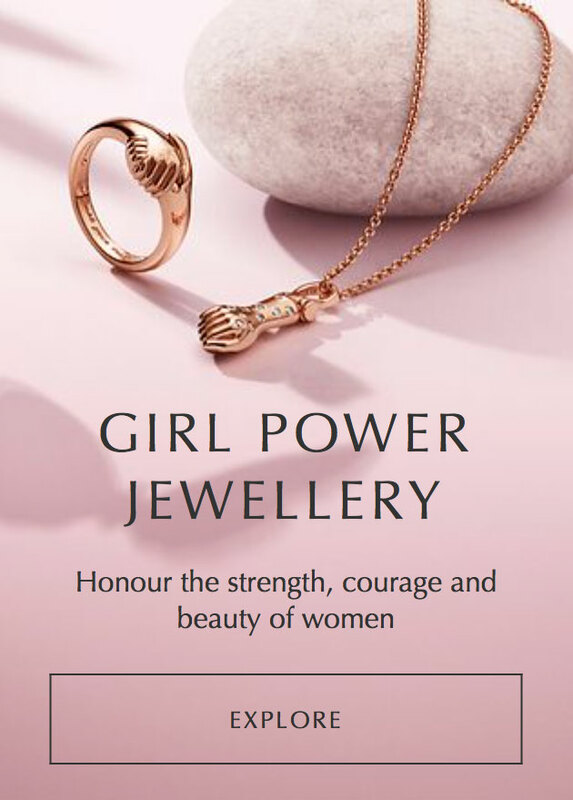 I heard that a designer left PANDORA a couple of years ago but that it would take a little while for the new designs to come through the collections. Hopefully we will see a change for the good starting with this Spring collection! The prices do seem much more reasonable too. That was one of the annoying things about lots of pavé charms – it would knock the price up. It’s nice to be excited about PANDORA again! Thank you for commenting and enjoy your day! Great post and great collection. Looking forward to it. Thank you for your kind comment. 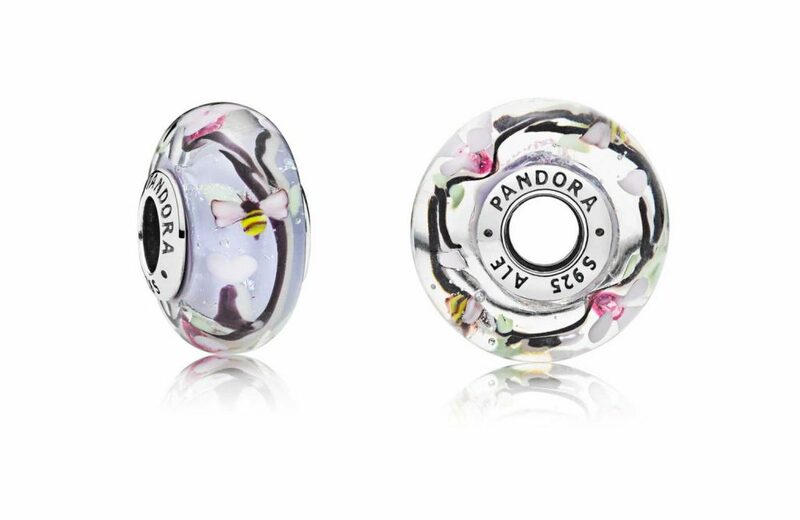 I think most PANDORA fans are happy with the upcoming Spring and Mother’s Day collections. 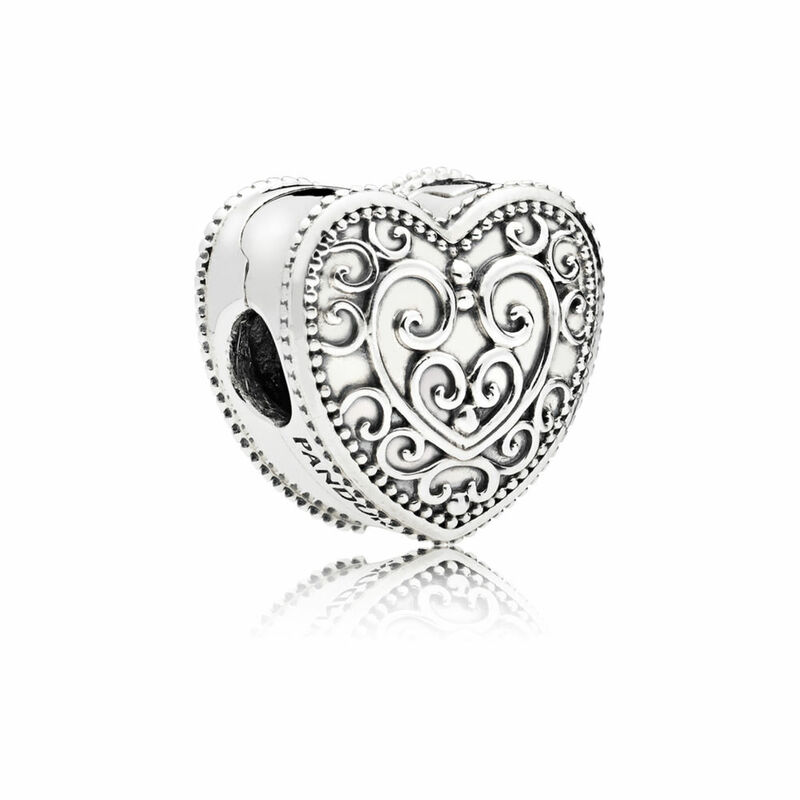 I’m pleased to be excited about PANDORA again as there wasn’t a lot I liked from the Valentine’s collection. Now my wish list is growing again! I’m in troubles!! I have an enormous wish list! 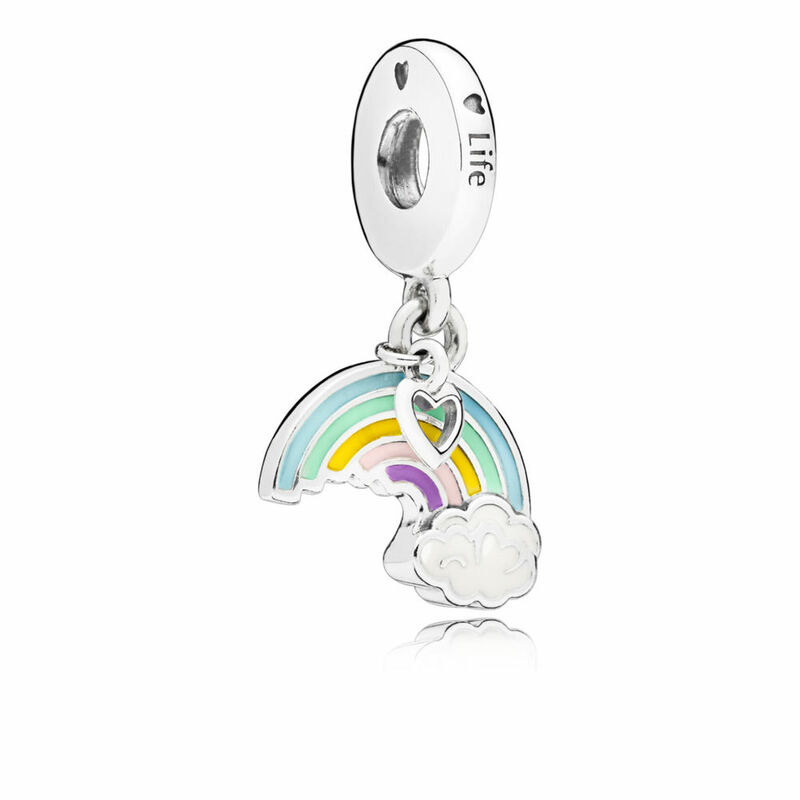 All the Disney charms are must haves, and also there’s a lot of different charms in this collection that I want! The spring bird house is perfect for my mom, her garden is always full of birds because she always feed them! The robot is cute, but I think it will be hard to style… Thanks for all this amazing info!! Nice weekend! Don’t worry! We’re in the same boat! My wish list has grown a lot! I love anything nature related so the spring birds are ideal for me. I know what you mean about the robot but she is a definite for me. I’m thinking of getting both versions and styling them together like little robot friends. 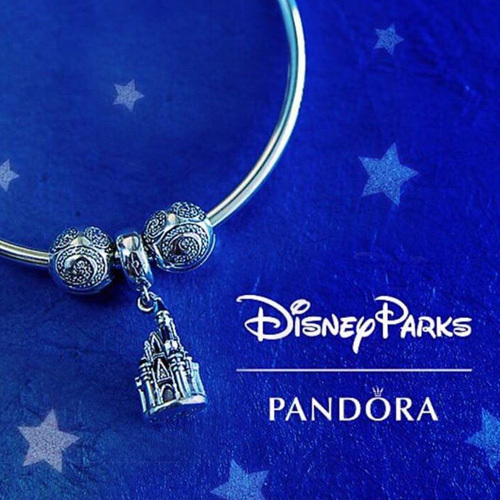 It is such a different style for PANDORA that it has got me very excited about what will be coming next! Will there be any essence beads released with the spring collection? There will be Essence Spring 2018, but I don’t have all of the information yet. Hopefully I can post something this week. thanks for the preview! 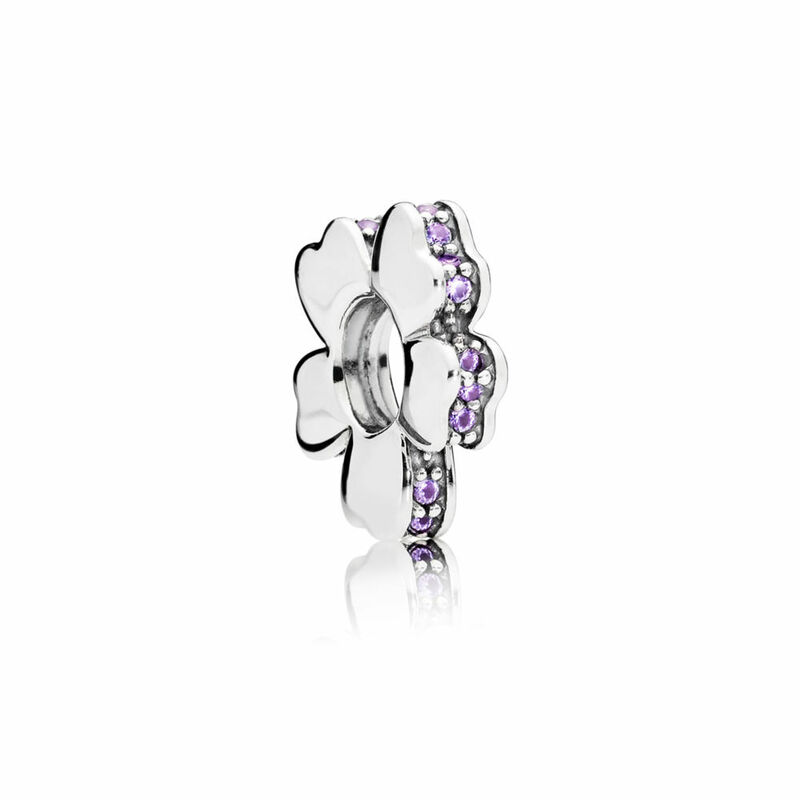 could you plz do one for the spring pandora rose collection if there is one? thanks in advance!